In this gallery we explore the best kitchen paint colors for a variety of cabinetry and design styles. Paint colors make up a huge amount of our kitchen’s visual aesthetics. Not only do they contribute to aesthetic appeal and interest, but they also help set the mood in the space and helps create the overall “feel” of the room. Experts agree that it’s not just the paint colors of the walls that helps determine the overall look and feel of a space. In a kitchen, your wall color must also relate to the colors of your cabinetry, the countertops, the back splash materials, floor finishes, appliances and accessories. With all the visual elements to consider, and all the endless paint choices to choose from, choosing the perfect paint for your kitchen can be quite baffling. Before you rush out to buy that gallon of paint, it is important to know what colors work best with specific kitchen cabinet colors and finishes. Below, we give you our very own complete guide on the best kitchen paint colors to help you eliminate the guesswork in formulating an effective color scheme. With hundreds of paints to choose from, deciding on the right color for your kitchen walls can be quite a daunting task. Likewise, coming up with a well balanced overall color scheme for your kitchen can sometimes feel confusing. However, there are several tips that can help you narrow down your choices. Keep in mind that there no strict rule for choosing the right kitchen paint color, but there are guides which can help you find the right color for your design style and personal taste. Envision the general “feel” and overall look you want to achieve for your kitchen. 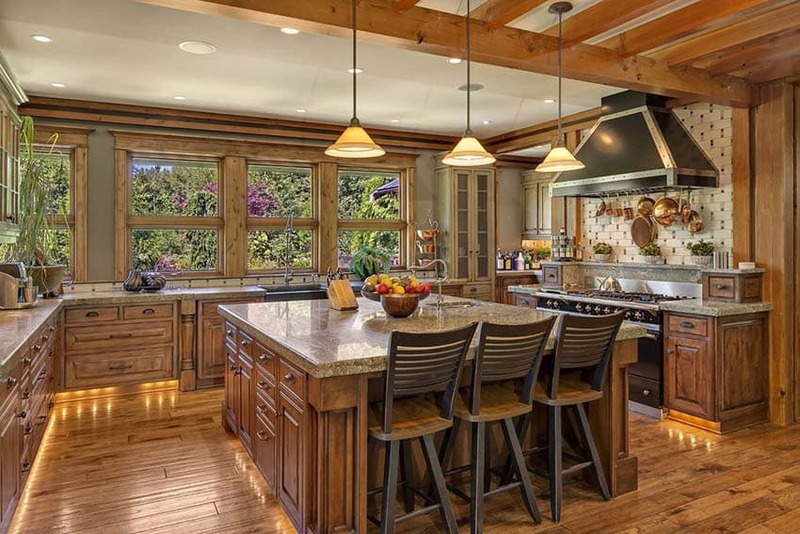 Ideally, the look of a kitchen must jive with the prevailing style of your home. However, there is no limit in design and you can be eclectic if that suits your taste. Before applying that paint color to your kitchen walls, take some time to assess the room and determine the look and feel you want to imbibe. Do you want your kitchen to look like a beach inspired haven, an ultra modern space or perhaps something country or retro? Each inspiration and period style is commonly associated with a prescribed color palette. A modern kitchen, for example, would go for neutrals with bold accents, a country kitchen is geared towards warm colors while a cottage inspired kitchen will typically include charming pastels and soft hues. 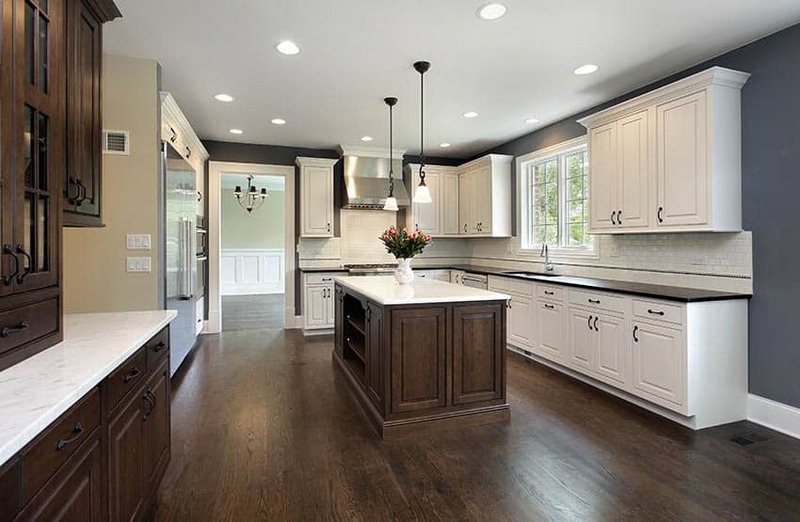 Once you have decided on the direction you want to follow, it is much easier to narrow down your choices and select the best kitchen paint color that will work for your home. Consider all the other visual elements in your kitchen. Before you get started with choosing the right paint color for your kitchen, there are a few items that you need to take into consideration. Other visual elements in the space such as the accessories, furniture, furnishings and finishes can help you narrow down your kitchen paint choices and choose the best which will help you create a well balanced color scheme. 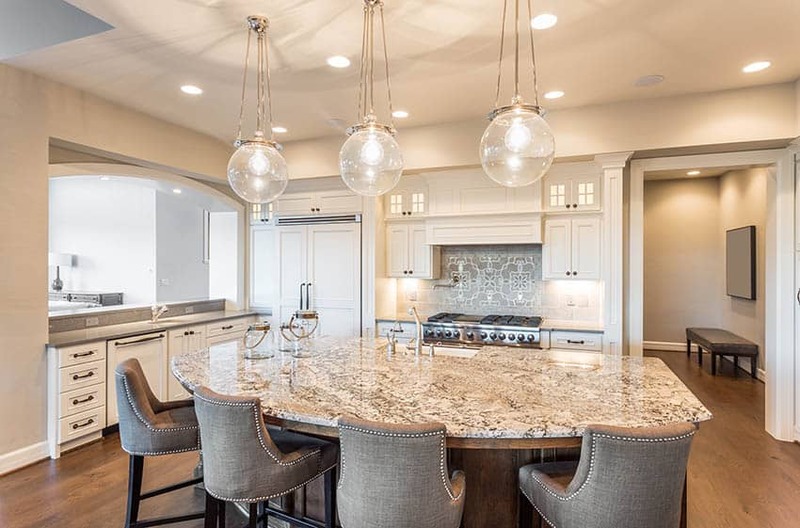 Think about the dominant features in the kitchen such as the countertops, flooring material, kitchen cabinets, backsplash and fixtures that you plan on installing or already have. The cabinets, for example, are the most dominant feature in a kitchen, and choosing a wall color which will clash with it will definitely be a big eye sore for your home. Since camping your paint colors is highly advisable before you commit to them, make sure to paint your wall sample as close to your kitchen cabinets to see if they jive with each other. However if you are also planning to get new cabinets, select the paint you need for this first before choosing the wall colors as they can help dictate the rest of your color scheme.The countertop is also another important consideration when selecting the right wall color for your kitchen. A neutral colored countertop presents more options and flexibility for choosing paint colors which can be used for a kitchen. A darker colored countertop with busier patterns or more undertones can be complemented with neutral wall in order to prevent the space from looking heavy. Alternatively,if you are planning on completely changing the whole look of your kitchen and is deciding on buying new furniture and accessories, then you can use your kitchen paint color to anchor the space and it can serve as a foundation for all the other items that you will be needing. If you take into consideration all of the elements in the space, you are more likely to come up with a color scheme that makes sense for your kitchen. Purchase semi gloss or satin finish for your kitchen walls. 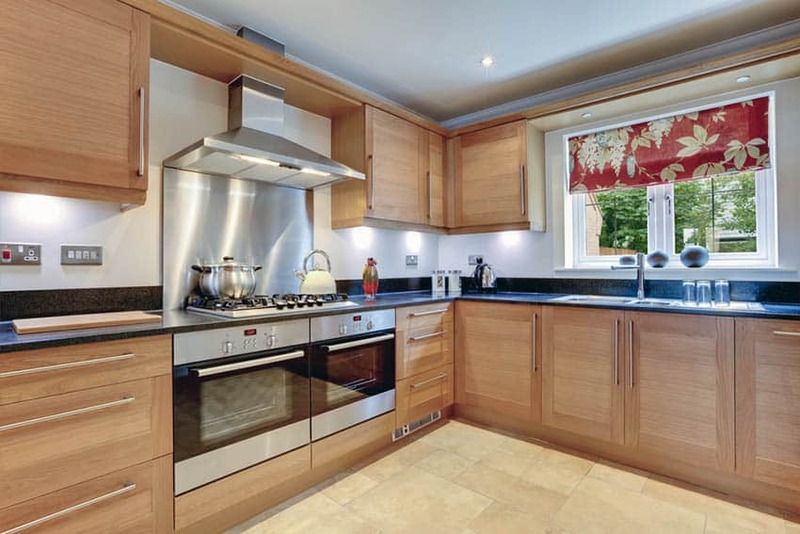 Kitchens are high traffic areas and they are constantly used on a day to day basis. It is highly exposed to moisture, dirt and grime, oil splatters, grease and food residues. With that in mind, maintenance and performance must also be a high priority when choosing the right paint for your kitchen. The flat paint finish does not work well for kitchens because it has the tendency to get dirty more easily. Semi gloss surfaces which are smoother, can be wiped down more easily and are more low maintenance than flat finished walls. Use oil based paint for your kitchen cabinets. If painting your kitchen cabinets, consider using an oil-based paint to ensure the paint does not peel off or chip over time. Kitchens are constantly exposed to high temperatures and moisture, and other types of paint can easily get damaged from such. Painting is a labor intensive process. Although painting does not require much skills and can be actually undertaken as a do it yourself project, it is relatively a time consuming and labor intensive process. If you are planning to paint your kitchen walls and cabinets at the same time, be prepared for the heavy work and preparations. The process does not only including applying the paint per se, but sometimes it may involve wall preparations, repairing uneven or damaged wall surfaces or removing kitchen cabinet doors and unmounting hardware. Consider hiring a professional if you are not very handy. Always do your prep work before painting your kitchen. Before painting your kitchen, make sure to remove any type of appliances such as the fridge, stove or small appliances like blenders, microwaves, etc. Remove any type of hardware and keep them in a safe place if you plan on using them again. Before applying paint to your walls, make sure to clean them. Wipe down your walls using a cloth to remove any type of oil, grease and dirt. Most of the time, even if your kitchen’s walls have already been cleaned, there’s some chance that they still have some grease and moisture on them, and putting on a coat of primer before applying the first coat of paint will make sure that the paint glides on smoothly to the surface. Use painter’s tape to outline the edges where the kitchen cabinets and walls meet, and to avoid any stain in your floor, make sure to cover it with drop cloths, plastic or newspaper. Always sample your paint your paint choices before deciding on the final color your want for your kitchen walls. Perhaps, you may have fallen in love with that charming lavender wall paint you’ve seen in an interior design magazine, or have been feeling all excited with that hundreds of paint swatches that you’ve seen in a local home improvement store, but keep in mind that the color of the paint may vary once applied to an actual wall or a bigger surface. A certain shade of paint may look lighter or darker, depending on the lighting conditions of the space. Sampling the shade that you prefer is the best way to know whether you want to stick with it or change it. Most suppliers offer paint in small quantities which can be used for sampling. If you are deciding on three shades, apply all of your samples into one wall so you can compare which one works best. You can also use your wall samples to compare with swatches of your flooring, kitchen cabinet finish and countertop to look if they match. Sampling also provides you an overall feel of the paint color in your kitchen. Keep in mind the resale value of your home. If you are planning to resell your home in the future, it is important to choose a kitchen paint color that will not go out of style. While you may be really attracted to a bold shade, some potential buyers may find it too intense or less appealing. 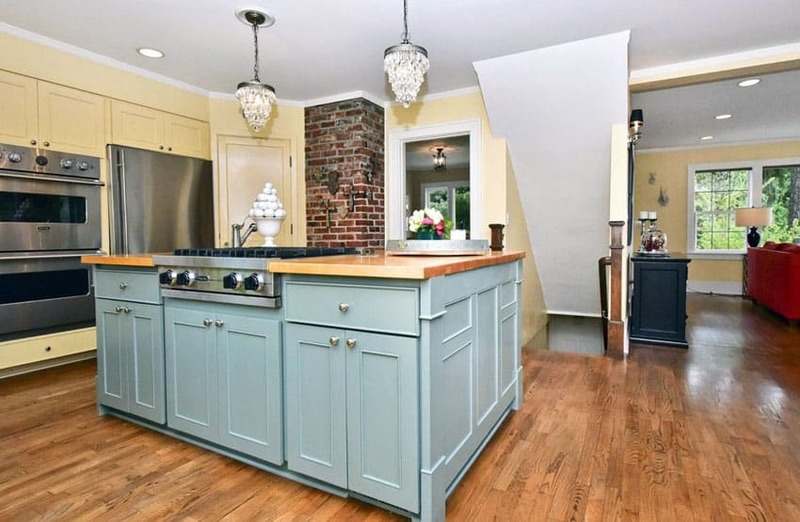 Your kitchen paint color must be refreshing and must not make potential buyers feel dragged. Opt for muted hues, toned down colors and neutrals as these colors are proven to be more timeless and can go well with almost anything. Decide whether you want to blend or contrast. Blending and contrasting are two different ways to create a stunning and well balanced color palette for your kitchen. It all depends on the main aesthetic attribute that you want to stand out in the space, whether it may be harmony or contrast, or the effect you want to achieve for your kitchen’s color scheme. Contrast can be achieved by choosing a dark color for the walls or a light color for the kitchen cabinets. Blending, on the other hand, is the opposite, light walls with light colored cabinets and countertops. Contrast helps create a striking and bold statement, while blending creates a more minimalist and uniform appearance. 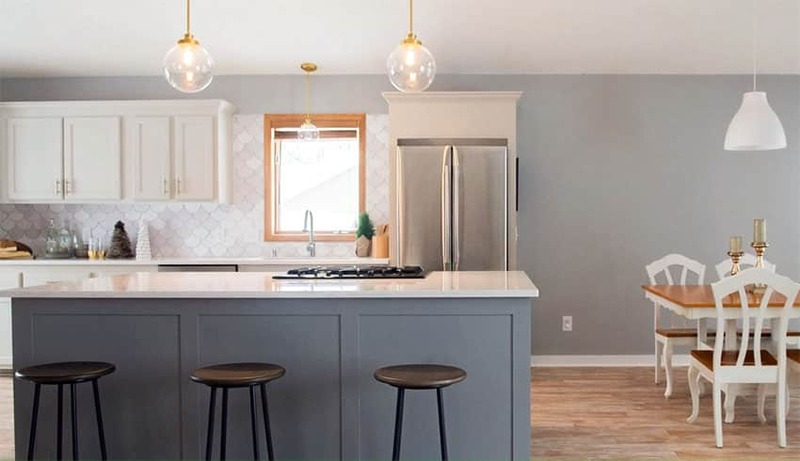 Once you have decided on whether you want to blend or contrast, you can now apply the color variations on the dominant elements of your kitchen, such as the wall paints, kitchen cabinet colors, countertops and flooring. Do not forget to personalize. The beauty of interior design is that it allows you to freely create a space that will cater to your personal needs and will suit your personal taste and style. You can choose your favorite color to paint a wall in your kitchen to make a mark of your personality in the space, then complement it with other design elements. It is common knowledge that white and light colors can instantly create an impression of spaciousness, making them the best paint color for small kitchens. White and light colors can instantly make small rooms appear bigger because they bounce off light better than dark colors. They do not only lighten and brighten a room, but light and white colored walls can also maintain a sense of simplicity and visual uniformity. A light color palette that is dominated by light colored walls can easily add life to a space, while also not being too heavy on the eyes. In the same way, a kitchen that dominated by crisp white tones can help create a more airy and brighter ambiance. White painted walls are one of the best options you can explore for a small kitchen. In addition to all of the mentioned benefits above, white calls can simply add a touch of class and timelessness to a space. It will never go out of style and is versatile enough to work its way into different types of kitchen styles whether it may be traditional or modern. Aside from that, there are hundreds of paint choices for the color white alone, and it comes in multiple shades and tints. Some geared toward a very ultra white color, while others belonging to the warmer side of the spectrum with their warm undertones. The key to choosing the right white paint for a small kitchen is to understand the prevailing style of the space. 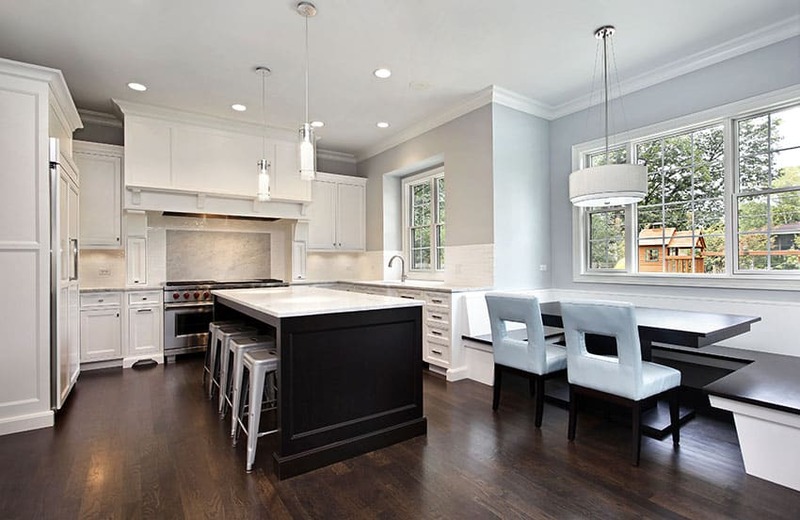 Traditional and transitional inspired kitchen settings tend to go with warmer shades of white, while contemporary and modern inspired kitchen settings call for the brighter and “whiter” counterparts. There are many ways to explore a white paints for small kitchens. You can either go with a all white color palette to maximize the space to its fullest potential, or introduce pops of colors to prevent the space from looking too bland. Layering different versions of white and complimenting them with a variation in the finishes and textures can help create depth in a small kitchen space, while also providing a heightened level of visual interest. Light colors and pastels are also a great choice for small kitchens. Basically, a pastel color is just any dose of bright color that is toned down with large amounts of the color white. Almost any hue can be turned into a pastel with the addition of white to it. Although soft on the eyes, pastels can still create a lively atmosphere for a small kitchen space without making the space feel too overwhelming or cramped. Some popular pastel colors which work best as a paint color for small kitchens include mint greens, pale yellows, powder blues. Despite the limited size, you can still turn a small kitchen into any type of setting, while also making it feel bigger. Cerulean and powder blue paint can be used to transform a small kitchen into a coastal haven. Mint green paints can be used to give small kitchens a vintage appeal, while soft mellow yellows can be used to evoke cottage charm in a small kitchen. In addition to choosing white and light colors as paint for small kitchens, it is also ideal to enhance the space with good lighting. Lighting plays an important role in the way color is perceived. 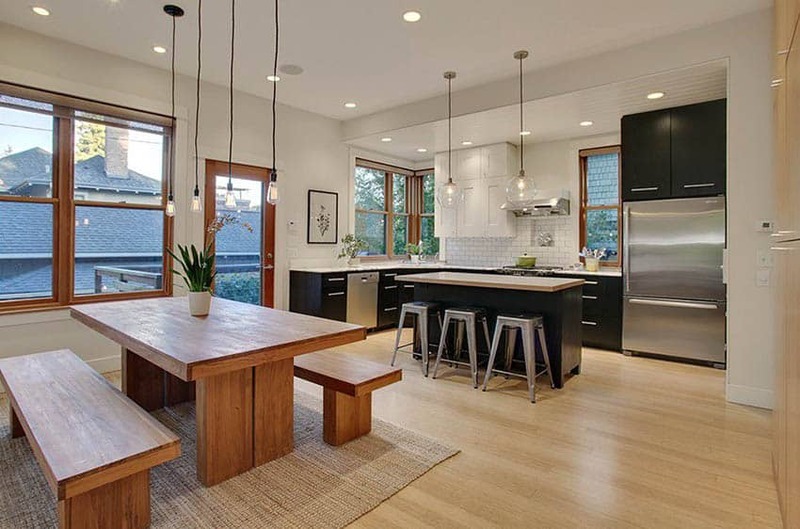 Good lighting is also essential part of creating the right mood and ambiance for a small kitchen. Keeping your small kitchen adequately lighted can double the effect of light and white colored walls in making the space look brighter, more airy and bigger. There are actually no hard rules which you need to follow when it comes to choosing a color palette for your kitchen, but the wall color can give you a good head start when deciding the rest of the colors for the space. 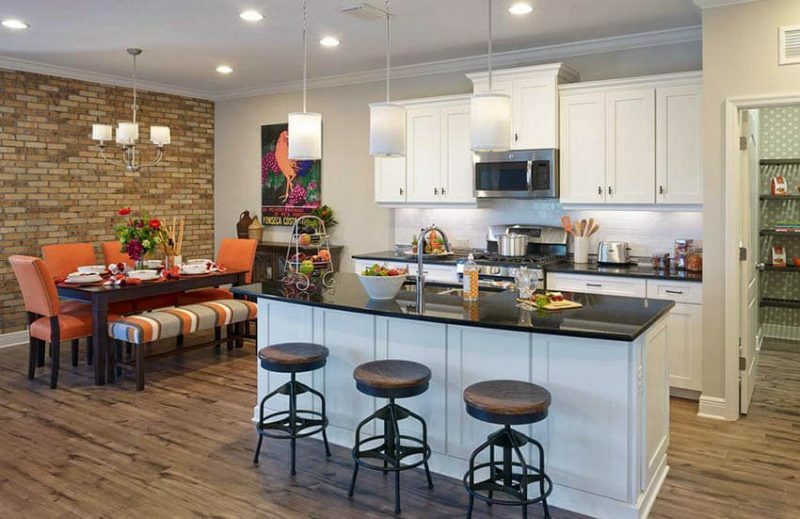 The walls, next to the kitchen cabinets, are one of the most dominant features in a kitchen and most often they can help dictate the overall look, ambiance and feel of the room. They say that colors are not only integral in interior design in terms of aesthetics but also in creating an atmosphere, and a a good way to narrow down hundreds of paint and color choices is to understand a few basics on how colors tend to affect the people’s mood and perception towards it. There are certain colors which work best for bedrooms, living rooms or, in this case, kitchens. The bedroom, for example, being a place for rest and relaxation, would require a calm and refreshing color palette, and a good way to produce such is by using cool hues by blue and green. 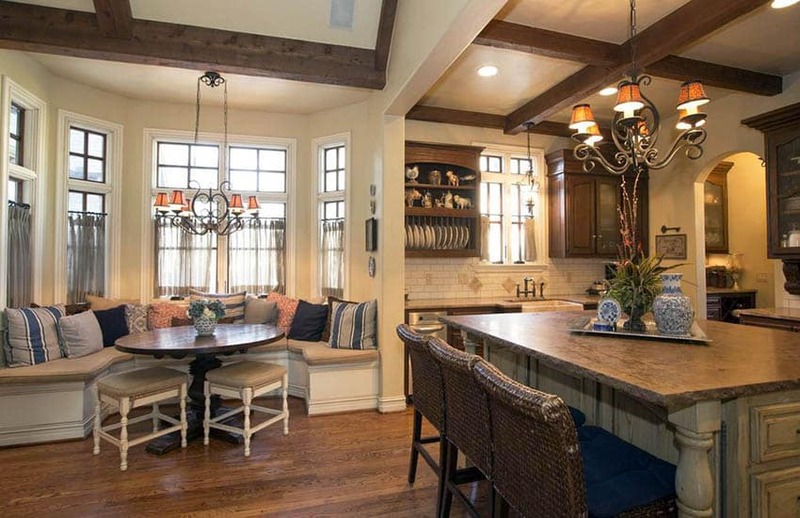 In the same way, the kitchen, being the heart of the home, needs to promote an inviting atmosphere. Some of the most popular paint colors for kitchens include neutrals like white and gray, warm hues like red and yellow and cool hues like blue and green. You can help match colors by downloading a paint color app found on this page. Below we discuss how each of these colors can be used to brighten up the most important area of your home. Neutrals have always been a staple as a wall color for most homes. While these colors are often perceived to be too safe, dull and boring, they can indeed be a stand out when used with the right layering of finishes, textures and accents. Neutral colors include shades of white, black, gray and brown. While its variations include beige, ivory, taupe or those that “appear to be without color”. Neutrals typically have undertones and with enough tint or shade, any color can become a neutral. It can be adjusted into different tints and shades, depending on what you want. With the addition of red, yellow and orange undertones, a neutral can be warmed up and alternatively, it can also be cooled down with the addition of blue, green and purple undertones. A safe choice for kitchen wall color is to use a mid range neutral. White – White is the “go to” shade for kitchen wall color. It continues to be a “classic favorite” in most households because it offers a wide range of possibilities in design. 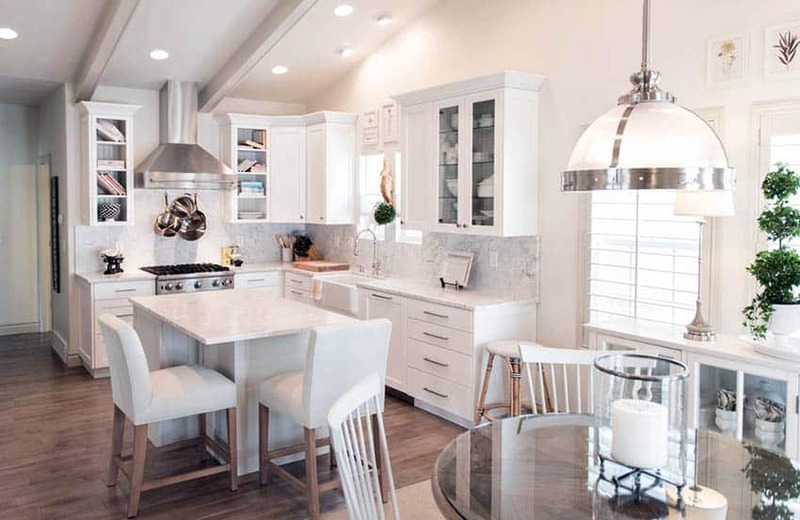 Although some perceive it to be lacking in character, white is actually one of the best wall colors because it is highly versatile and flexible when it comes to mixing and matching accessories in the kitchen. A crisp white wall can work like a blank canvass where you can introduce splashes of colors and a variation of textures and finishes. A white kitchen wall will not limit you from exploring cabinet colors, countertops or flooring materials. You can go with an all white color palette and enjoy a calming atmosphere for your itchen or you can combine white walls with pops of colors to create a more lively environment. The possibilities are actually endless. 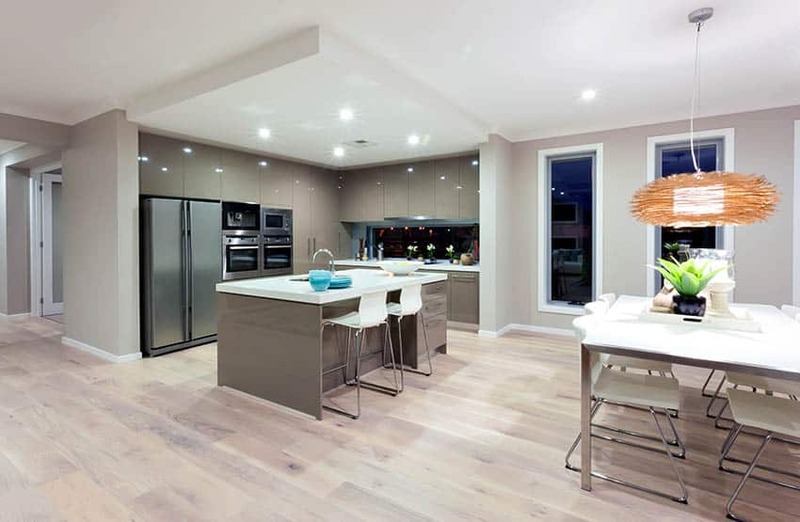 In addition to the remarkable versatility of white kitchen walls, it is also a proven to be a timeless choice and can go with any type of kitchen setting, whether it may be traditional, transitional, country, contemporary or modern. As most people start their days in the kitchen, a white wall can instantly make this room feel more energized. The color white promotes health, hygiene and gives the kitchen a fresh and clean look. Its crisp color can instantly make a kitchen feel more airy and inviting. And since it is a light color, it can bounce off natural lighting more easier, thus creating a brighter space. White and light colored walls are also highly suited for small kitchens because they can create an illusion of space, making the room feel larger. White on white color palettes are also a constant in the kitchen design scene. The reason for such is that, going with an “all white” scheme can instantly balance your kitchen and make it more calming, especially that it is considered to be one of the busiest areas of the home. Walking in an all white kitchen can make you feel relaxed, but at the same time, it can wake you up. An all white look for kitchen can be pulled out by using white walls with white cabinets, white countertops and a white ceiling. With the right texture, this look can be super stylish and stunning. Beige – For those who find a white wall too boring, you can adjust the tints and shades of the hue to get a nice touch of undertone. Beige walls, work the same way as white walls, but they have a warmer feel because of the yellowish tinge in it. Other alternatives for white which belong to the same color family are ivory, cream, cotton white, powder white, alabaster and ultra white. All paint suppliers offer the color white in different shades and you can explore hundreds of choices for your kitchen walls. Gray – Considered to be the “new neutral” in the interior design scene, gray continues to pick up steam in most homes as a color for walls, furniture, furnishing and accessories. Gray comes in different shades and tints and it can be easily adjusted to produce the right color temperature for your kitchen walls. Although often perceived as being too cold, gray walls can actually render a strong statement to your kitchen. 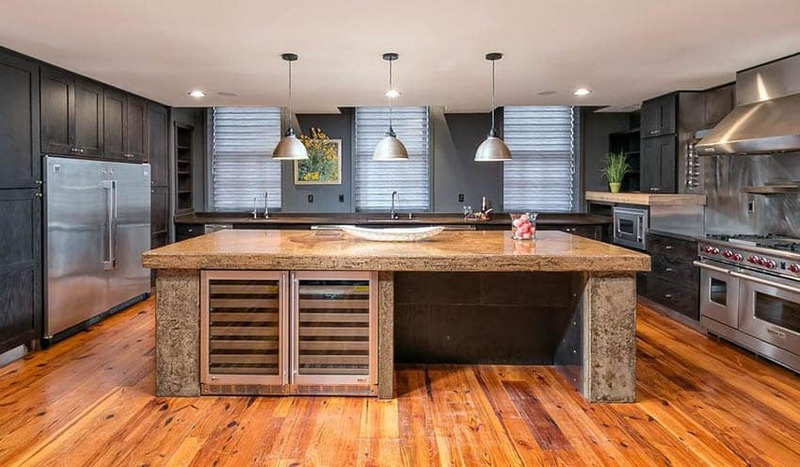 It can create a dramatic look, while also lending a quiet strength to spaces and can work as a perfect base for creating a stunning color scheme for a kitchen. Gray walls can work wonders in a kitchen setting. Since it is a neutral, it offers versatility and flexibility in terms of mixing and matching other elements in the space. Gray walls can pair beautifully with lighter neutrals like white or beige to create a serene kitchen setting, or it can also be complemented with vibrant splashes of color like mustard yellow or pumpkin orange to produce a more modern vibe. Not only does it work as a wall color, but gray can also be used as a countertop and cabinet color for kitchens. In general, gray walls can be used for any type of kitchen setting, whether it may be traditional or modern.Overall, gray walls exude sophistication and stylishness. Depending on the shade or tint of gray, you can create different atmospheres or your kitchen. A cool, soft shade of gray for the walls can create a calming effect in a kitchen, while a dark, strong shade of gray can create drama and can anchor the space. Tints and shades which belong to the color family of blue, violet and green are classified as cool hues and are best known for the calming effect and the refreshing feel that they contribute to spaces. Among these colors, blue and green can be used to create a bright and inviting kitchen setting for your home. 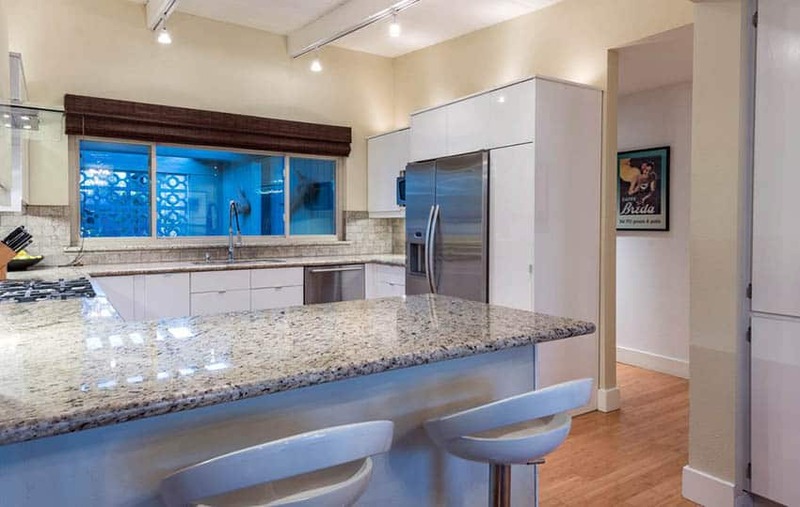 Blue – The color blue is a surprising choice for best kitchen wall colors mainly because it is traditionally known for being a “downer” or a color which naturally suppresses one’s appetite. Perhaps this is because there aren’t too many food choices which have a natural blue color, and that some of its shades can actually look unappealing. But the best thing about this color is that it is inherently calming and refreshing. It comes in a wide range of tints and shades, and with the right tone a blue wall can instantly make your kitchen a stand out. There are specific shades of blue which work best for a kitchen setting. When used for walls, lighter shades of blues such as powder blue and sky blue can help create a clean, crisp look for a kitchen. Darker shades of blue can also be used for walls to create a more dramatic look, as long as it is balanced out and accentuated with hints of neutrals like white and shades of gray to prevent it from looking too intense or heavy. The color blue, in general, will work best on a kitchen setting especially when it is used sparingly, and the walls are a good way to introduce it to a space. There are other ways to use blue walls in a kitchen setting. Crisp blue walls can be paired with white kitchen cabinets to produce a beachy or coastal vibe. 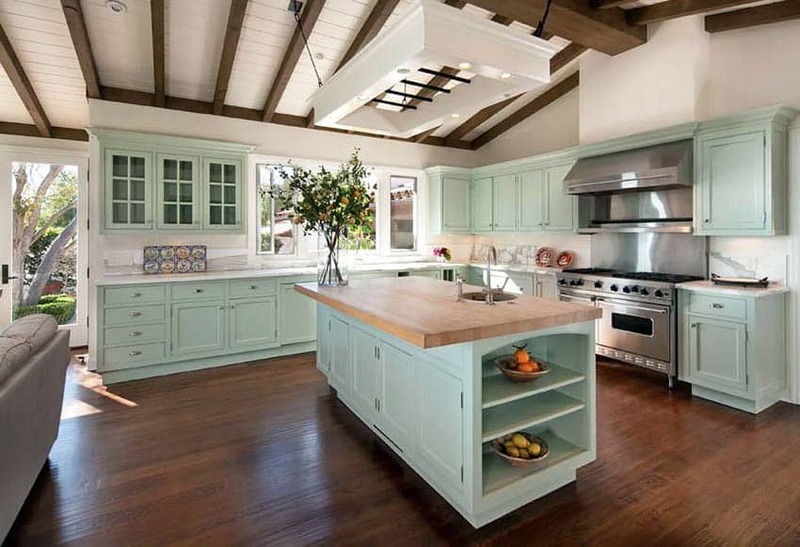 Robin’s egg blue walls can be complemented with wooden accents to create an inviting country kitchen. While dainty powder blue walls can be matched with beige cabinets to evoke a charming cottage flair. Navy blue walls can be paired with white kitchen cabinets and stainless steel appliances for a more sophisticated, modern look. Ivory accents and a refreshing blue wall can instantly render a strong vintage charm to a kitchen. In general, blue walls can add an invigorating touch to a kitchen. However, when using this color, make sure to use it in limited amounts as it has the tendency to overpower a room. Green – Green is another surprising color which makes it to the best kitchen wall colors list. More often, green is used for bedrooms because of its peaceful nature and ability to promote rest. However, the color green is also a smart shade to use in the kitchen. Inspired by the color of nature, plants and trees, the color green can lend an organic, earthy vibe to a kitchen space. Painting your kitchen walls green can produce a soothing atmosphere and a refreshing feel. A green wall also pairs well with white accents, shades of brown and other wood finishes. There are many different shades of green which can be used for kitchen walls. Lighter shades such as mint and apple green are popular choices because of the calming nature. However muted shades such as moss green, petrol green, sage green and hunter green are also picking up steam as a kitchen wall color. For homeowners who want to amp up the kitchen, an accent wall in emerald green can also be explored. This striking shade can instantly add a boost of energy to a kitchen without being too overwhelming. Warm hues such as red, yellow and orange are popular wall colors for kitchens because of their ability to stimulate the appetite and promote hunger. For those who want to create a warm, inviting atmosphere for your kitchen, these color are your best bet. Red – Red is believed to be the best color to stimulate the appetite. It is also the main reason why you see red as the most popular color used for food branding or as a staple in most restaurant color schemes. While red may be perceived to be as an intense color and a shocking hue, it can work well if used in a kitchen setting. This color is naturally welcoming and inviting. Typically, red is used if you want to add spice to your kitchen walls. It can keep a kitchen from looking too gloomy and can instantly liven up a color scheme that is dominated by neutral colored cabinetry, countertops and flooring. A red accent wall can also serve as a focal point in a kitchen. It works well particularly when combined with stainless steel appliances and white or gray kitchen cabinets. There are multiple shades of red that can work well as a kitchen wall color. The best shade of red that work well for kitchen walls are those that have hints of pink, but other tints and shades can be explored to produce a unique color palette. Deep, rich shades of red such as burgundy, maroon and wine are perfect for traditional inspired kitchen settings, while bright and intense hues such as fire truck red, crimson and scarlet are highly suited for creating a lively modern kitchen. While for those who do not want to commit to intense shades, muted reds such as vermilion and amaranth can also be used if you want to brighten up the atmosphere. Red walls are incredibly versatile and can be combined with a variety of kitchen cabinet styles and countertop choices. However, it is a bold color and going with a red wall can be a bit tricky to pull off. 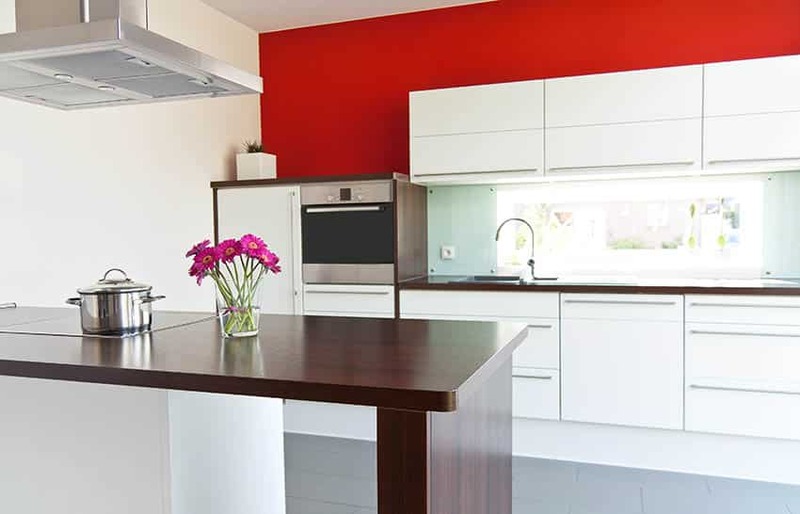 If you are using red as a color for your kitchen’s wall, make sure you do it right, as if it is not used sparingly, it may look too overwhelming and dark. Toned down yellows – Many people are drawn to the unique inviting character that a warm color can bring to a space. And just like red, yellow is another equally welcoming wall color can can be used for kitchen walls. Like a fresh ray of sunshine, yellow is inherently comforting, yet it can also brighten up a room in so many ways. Just like red, yellow is also believed to be an effective appetite stimulator. A yellow wall can instantly make your family or even your guests feel happy, but it can also make them experience calm. In addition to the pop that it can contribute to color palettes, a yellow wall can also make your kitchen feel energized. Like white walls, yellow walls help reflect the maximum amount of light in a space, so they also have the effect of making a kitchen feel less gloomy and more bright. Although dark yellows can be used sparingly in kitchen palettes, the best ones that work for this setting are the toned down versions of it. Light and mellow shades of yellow are a good option for walls of small kitchens as they can make the room feel brighter and bigger. Nature inspired warm tones such as copper, gold, henna, clay, ginger, mustard are also hot in the kitchen design scene right now as they work well for modern settings. Yellow walls perfectly pairs with most types of kitchen cabinet wood species and can complement white kitchen cabinets as well. However, the real beauty of yellow walls stands out when juxtaposed with shades of gray, especially the muted ones. 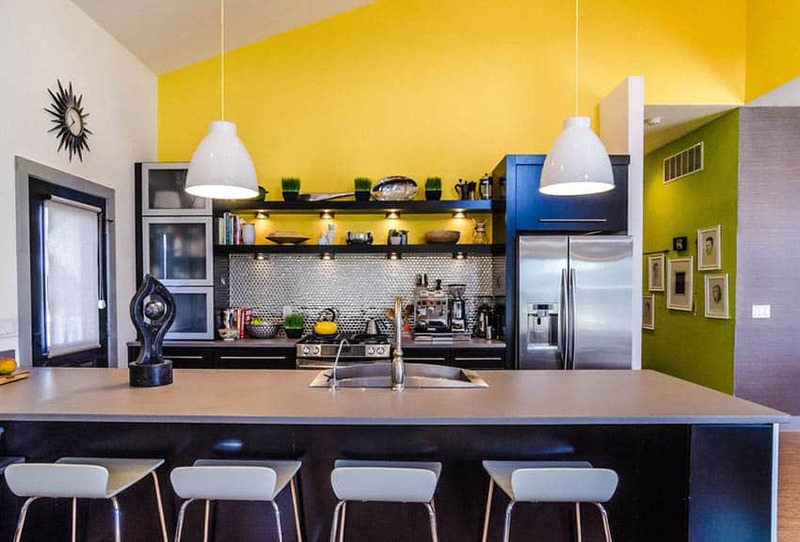 The color yellow does not only work as a wall color for kitchens, but it can also be introduced as a backsplash material, as an accent color for accessories or even for the inside of the cabinets. When choosing the right colors for your your kitchen walls, it is best to generally avoid colors which can make the space feel gloomy or too heavy on the yes. As mentioned, the kitchen is considered to be the heart of the home and it is where you often gather with family and friends. With such in mind, your main goal should be to promote an welcoming, yet relaxing ambiance. 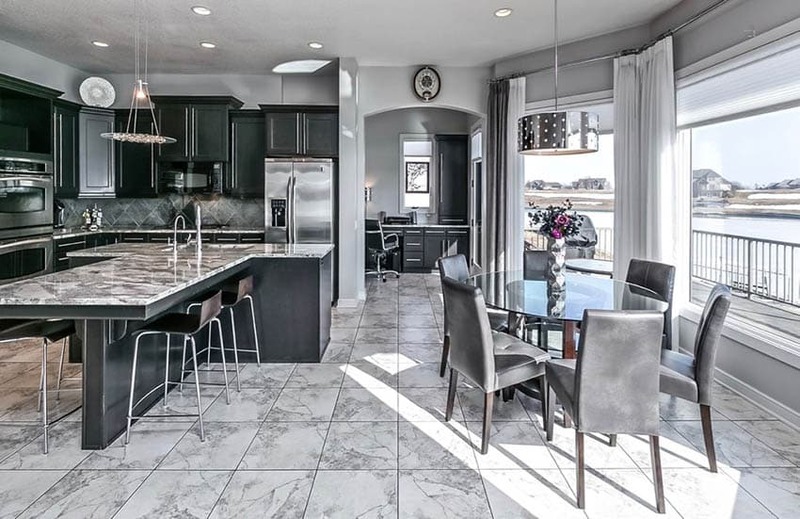 Black and other dark colors are typically not suited for this type of application, however when used as sparingly as possible for an accent wall or as a contrasting element to light cabinets, countertops and floor, this can still result to a unique color scheme for your kitchen. Both the living room and the kitchen are a place for congregation. Whether for family dinners or gatherings with friends, these two spaces are the primary areas that we frequently showcase to other people. With such, it is ideal to present them in the best way we can, to make your guests feel at home and welcomed. And with the amount of time that we, homeowners, spend in them, it is equally important that we design them to be relaxing and inviting. One of the easiest ways to bring out the best in our living and kitchens is to give them the right color palette. It is common knowledge that colors can help influence our moods, and choosing the right paint colors can affect the way we feel towards these spaces and the way we use them. Ideally, the best colors to use for living rooms and kitchens, are neutrals, greens and reds, as each of this specific shades render a different ambiance to a space, from soothing, to refreshing and inviting. For adjoining spaces or if your living room extends to your kitchen, the best design approach to use is to go with the same wall colors in order to create a continuous look and a smooth transition between the two rooms. 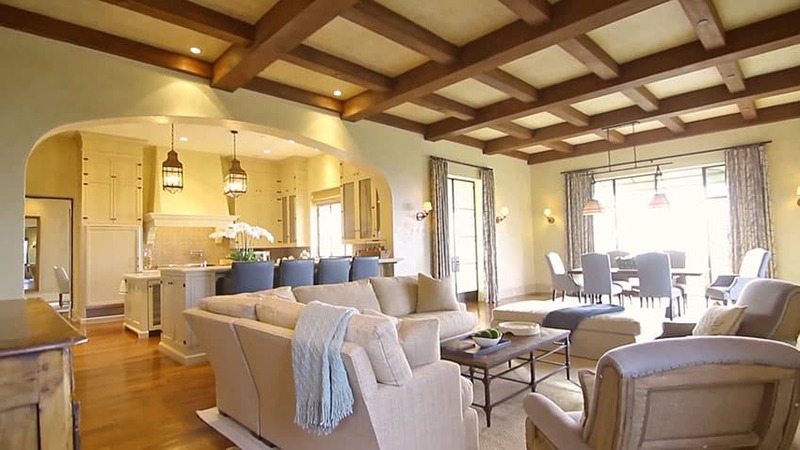 You can extend your wall and accent colors from your living room to your dining room, after all the primary purpose of linking the spaces together is to create openness and continuity. Warm Whites – White will always be a fail proof color choice, no matter what area of the house you may be dealing with. Needless to say, white is one of the most versatile and flexible colors. You can match it with any accent and it can easily be used to create contrast of harmony in a color palette. To top it off, white can help visually increase the space of your living room and kitchen, make it feel brighter, clean and more airy. Off Whites – White paint color continues to surge in popularity right now. Because of the increasing demand for white paint, paint brands continue to strive to bring thousands of variations of the color white in their products, providing for more options to choose from. However, with the range of choices and the freedom to go with any option that one desires, the best white paint colors for living rooms and kitchens are those that have a hint of warm or cool undertone. The reason being is that brighter shades of white or “ultra whites” have the tendency to make a space feel too sterile, or sometimes, even dull. By choosing a warm white paint color for your living room and, you are creating a relaxing yet inviting space. Beige – Beige is actually a shade of white with a warm undertone. The presence of the yellowish undertone in beige gives it a naturally cozy and calming feel. Since it is also a neutral color, painting your living room and kitchen in beige allows for a vast range of opportunities to work with different accent colors and finishes. Beige paint can also help create a sophisticated and soothing overall look for your home. Pale grays – A “barely-there” shade of gray is the perfect combination of a subtle neutral with just the right hint of cool color. Gray, in general, can be timeless or classic, but it can also be modern and edgy. It can perfectly usit any type of living room and kitchen setting, mood and design style. Pale grays also pairs well with whites and can help highlight these features without too much contrast. Also, pale grays are more compatible with a variety of other colors, so it gives you maximum creative freedom to experiment with your decor and accessories. Pale grays can also serve as a perfect backdrop to any style – whether it may be classic, modern or contemporary. It is one of the best colors to paint adjoining living rooms and kitchens since it can create a continuous, spacious look, without being too sterile. A medium toned red – The moment that your guests step into your living room, the first thing that you would want them to feel is a sense of welcoming presence and an inviting aura. In the same way, a kitchen needs to feel warm and stimulating to the senses. The best way to evoke such moods is to use a good medium toned red paint. A warm and vibrant living room color such as red, can easily give your whole house a wake up call. You can either paint all the perimeter walls in this strong color or alternatively, set out one wall as an accent wall and pair with with a medium-toned neutral wall color. Ideally, if you have a bold wall color, you need some sort of element to balance it. Avoid pairing it with since it can create a very stark contrast in the space. Some medium toned reds that work best for living rooms and kitchens are carmine, fire brick and chilli red. Another version of a muted shade of red is indian red, which has sweet pink undertones. Avoid going with too bright and intense shades as they can overwhelm the space and make it feel too shocking and distracting. Muted shades of green – Shades of green can help make a space feel refreshing and calming. In addition to its natural organic feel, green walls pairs well with wooden accents – which is a common feature in most kitchens and living rooms. Muted shades of green also have the ability to coordinate with gray or beige neutrals. The magic of using green walls is that it can either be warm or cool depending on the undertone. The darker the green is, the richer it gets, while the lighter the green is, the cooler it becomes. 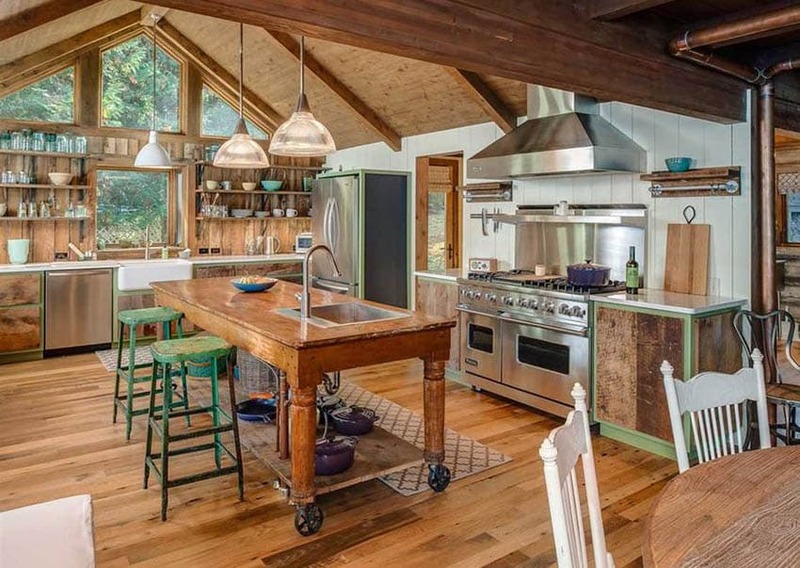 Also, if you love traditional styles such as comfortable lodges, cozy country and Craftsman kitchens, green is also one of the best paint colors you can explore for your living room and kitchen. Some of the best muted shades of green for living rooms and kitchens are Russian green,fern green and muted olive. For more ideas, visit this page to see foyer paint colors for a cohesive design for connecting your entryway to your living room space. 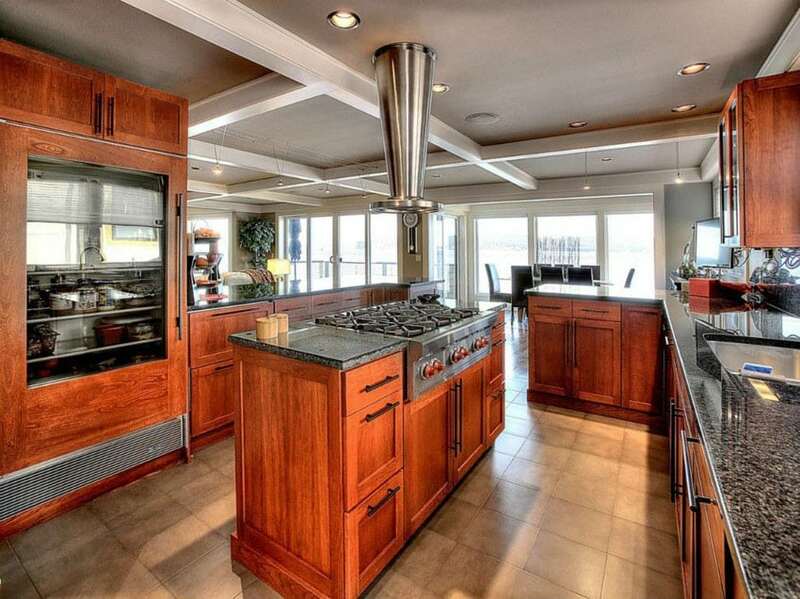 There is no doubt that the most dominant feature in a kitchen are the kitchen cabinets. 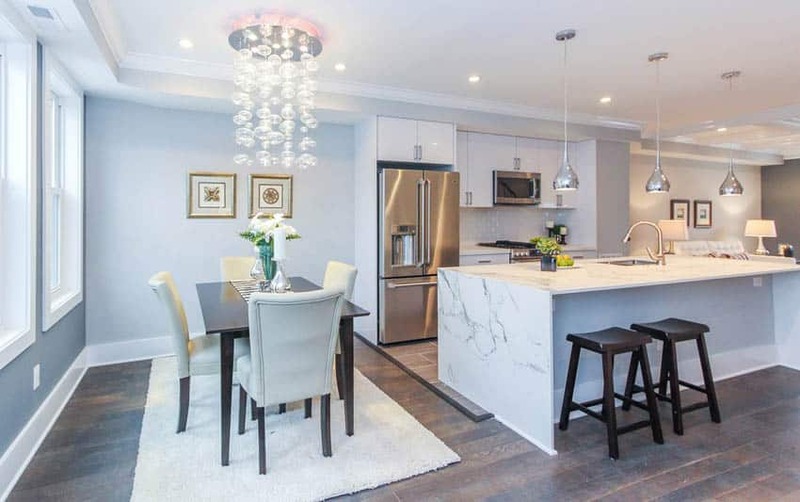 They take up at least 50 percent of the total area of a kitchen, are the first thing that you notice once you enter the room, and more often, designed to be the focal point of a space. With such in mind, it is important the every design detail that goes into your kitchen cabinet is given much thought, from the millwork, the style of the doors, hardware and most importantly its finish and color. The paint color of your kitchen cabinets can have a major effect on the overall look of your kitchen. 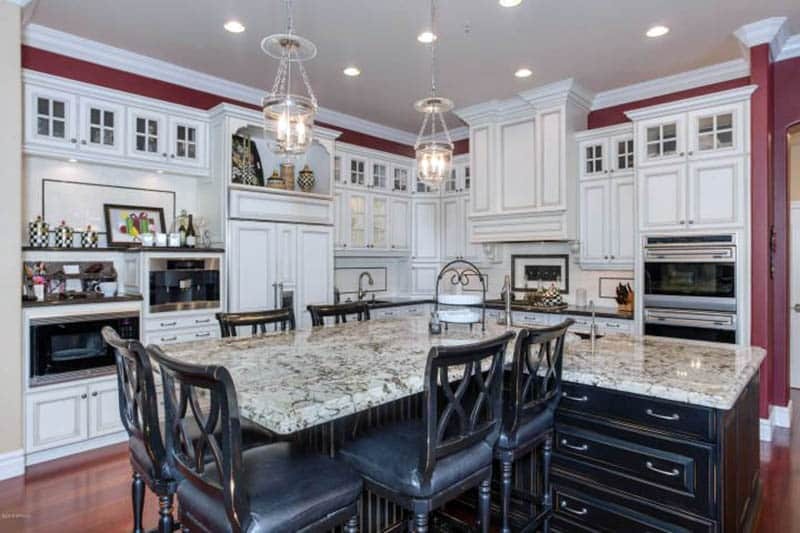 Because of the dominance, most homeowners tend to decide on the paint color for the kitchen cabinets first, to set it as a foundation for the rest of the room, when formulating the final color palette for a kitchen. The common design approach will often involve contrasting the colors of the wall and the cabinet colors. For example, if you choose a bold shade for your kitchen cabinets such as red, balance it out with a light gray wall, or vise versa. Or in some cases, homeowners just tend to go with a classic all white palette for their walls and kitchen cabinets to produce a clean and bright look. There are lots of colors that work well on kitchen cabinets, and for every specific type of color, each paint manufacturer can produce their own numerous versions of it. And since design is mostly based on one’s preference and taste, any color can be used to produce a unique kitchen cabinetry style for a home. If your kitchen cabinets are painted in a color that you do not particularly love, chances are you will eventually get tired of them and want to repaint them in time. Before selecting your final kitchen cabinet color, it is important to take into account several factors and visual elements in the room. Choose a color in relation to the countertop material, wall paint, backsplash finish, floor and appliances. Also, consider the prevailing style of your home and the cabinet design that you already have or plan to use. 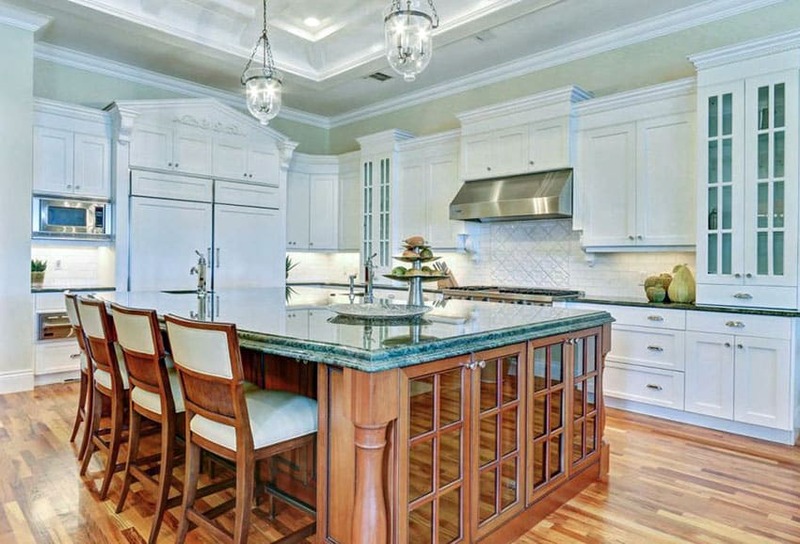 In general, traditional kitchen designs could go for classic cabinet colors such as white and beige. 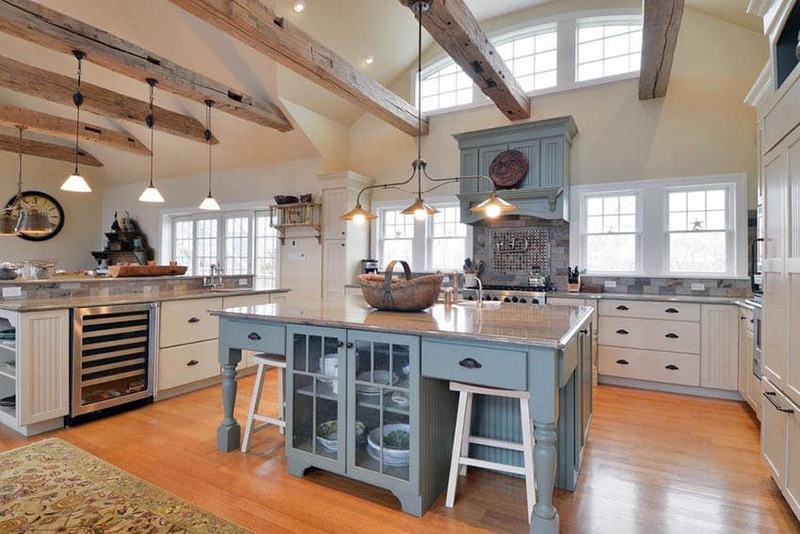 Arts and crafts, shaker style kitchen cabinets lean towards wood finishes and subdued creamy white hues. Contemporary, modern and retro kitchen cabinet designs benefit from bold, playful hues and contrasting tones. Think of lime greens, intense reds, sunny yellows – bright and vibrant colors that livens up a space. White – White cabinets will always remain to be a favorite in most kitchens because of their fresh, crisp and classic look. White kitchen cabinets look good with most colors and it allows you to freely experiment on the color of your walls, countertops, backsplash, flooring and accessories. They can easily brighten up a room as it can reflect light better. A fresh coat of white paint is also by far, the easiest way to update and liven up old cabinets. There are many different shades of white paint to choose from, ranging from crisp, bright tones to creamy ivory to warm beiges, and all of which can be used to finish a variety of kitchen cabinet styles, whether it may traditional, cottage country, transitional, farmhouse, contemporary or modern. For traditional kitchen cabinet designs, opt for white paint which is leaned towards a warmer undertone, such as beiges and cream. You can either have them in a stain finish or ask a professional to apply it using special techniques such as distressing, antiquing and weathering to give it a more time worn feel. While for contemporary, modern and minimalist kitchen cabinet designs, go with the brighter whites to create a more airy atmosphere and a simple aesthetic. Also, opt for a ultra polished and smooth finish for that sleek look. Browns and wood finishes – Paints in shades of brown, wood finishes and stains are also a one of the most popular colors for kitchen cabinets. Wood cabinet colors range from bleached, blonde to brunette tones. Some have cool undertones with a mask of gray in their surface, while other have a warm undertone with tinges of yellow, red and orange. 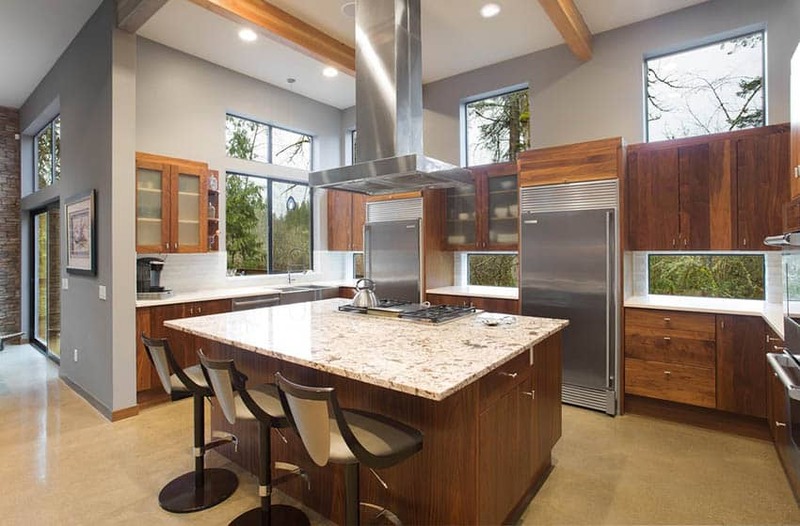 Most people gravitate toward wood finishes and shades of brown for their kitchen cabinets because it can complement a lot of different colors. Whether you plan on blending your kitchen cabinets with the a monochromatic color scheme, or plan on contrasting them with the rest of your color palette, a good shade of brown can help you do the trick. Wood finishes, whether light or dark, helps project a cozy and inviting atmosphere. In addition to this, allowing the inherent color of wood to stand out also enhances the natural warmth that it can bring into a space. Black and Charcoal – Black is another neutral color which counts as a best color to paint kitchen cabinets. If you want to create contrast in your kitchen cabinets, there is no better color to use other than black. 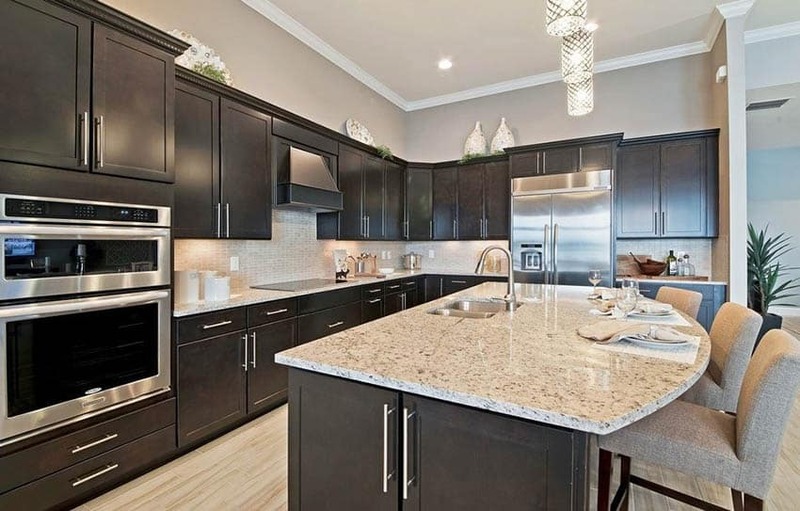 Black kitchen cabinets pair beautifully with countertops, walls and floors in lighter shades. 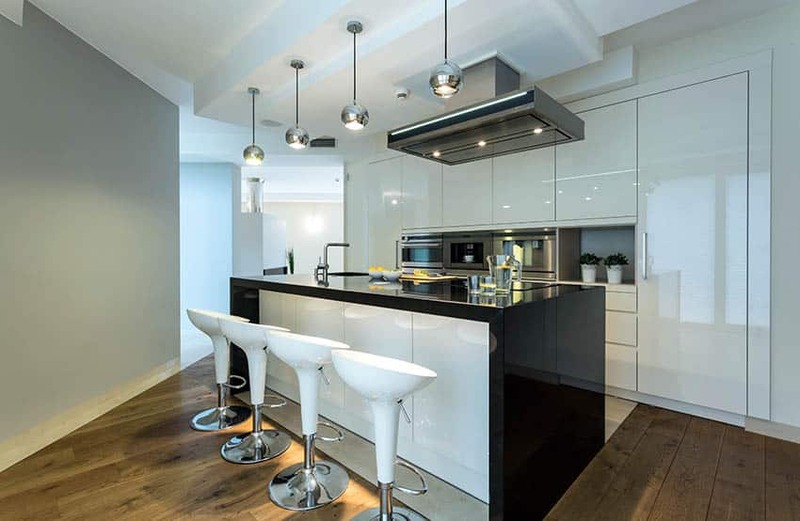 Although more commonly found in modern kitchens, particularly those with mid century inspiration to ultra sleek minimalist styles, black kitchen cabinets can also work for traditional kitchen setting. If black paint does not suit your taste, you can also explore other dark shades which belong to the same spectrum. Look for paints which have a hint of gray, to help diffuse the heaviness. Examples of which are charcoal, graphite and iron. Gray – Gray is the hottest kitchen cabinet color nowadays. Considered to be the new neutral of the interior design scene, the color gray can instantly add a sense of stately glamour and sophistication to any space. Gray kitchen cabinets share the same attributes that make white cabinets well loved in the interior design scene. It offers neutrality but has a more understated tone, more character and just the right balance of cool and warm undertones. 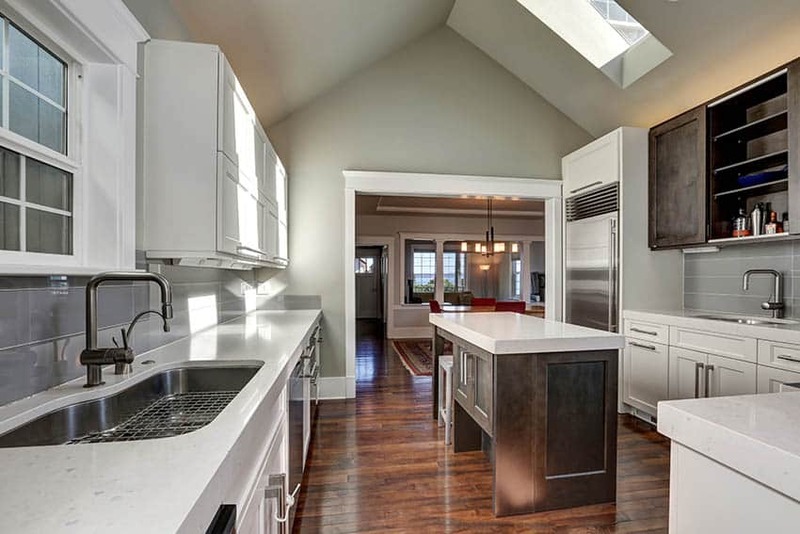 Various shades of gray work well as a paint for kitchen cabinets and can help ground your space, providing creative freedom and allowing for more options in countertops, wall color and flooring. In addition to its flexibility, gray kitchen cabinets also offer more opportunity to incorporate other colors into a kitchen’s color palette, whether it may be warm or cool accents. Gray kitchen cabinets also provide a sleek and sophisticated look for modern kitchens. When paired with the right countertop, it can allow kitchen accessories to pop out. The moody color of gray kitchen cabinets can also help bring drama into a space, without being too overwhelming. 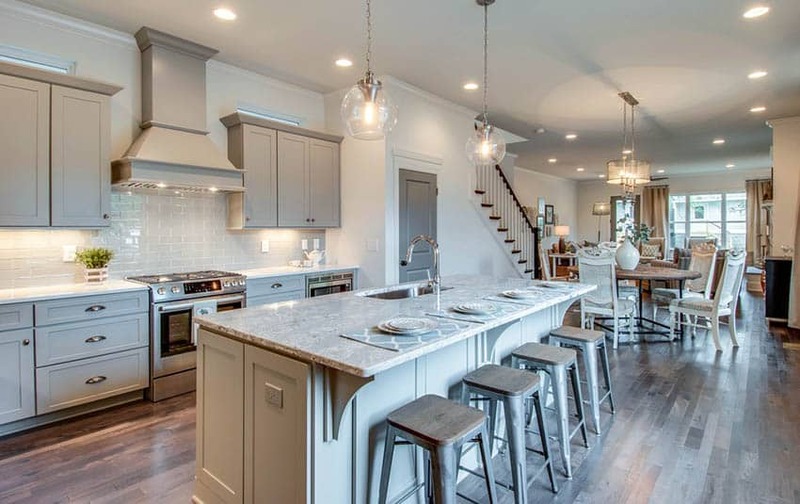 Lighter shades of gray can help create a more casual and comfortable kitchen atmosphere, while warm shades of gray can be used as a statement making color in a space. Although lighter shades of gray will never brighten up kitchen in the same way that white kitchen cabinets do, there are cooler tones in the market which can also help create a clean and airy feel for your kitchen. Gray kitchen cabinets are best paired with a balancing element, such a crisp white walls, sleek metal hardware or stainless steel appliances. There are several shades of gray which can be explored as a kitchen cabinet color, from light grays such as cloud gray, to muted grays such as pewter and stone. However the biggest color trend in the kitchen design scene right now are the warm grays or those that belong to the “mid to dark” end of the spectrum. Examples of which are smoke gray, ash gray, slate gray and pebble gray. 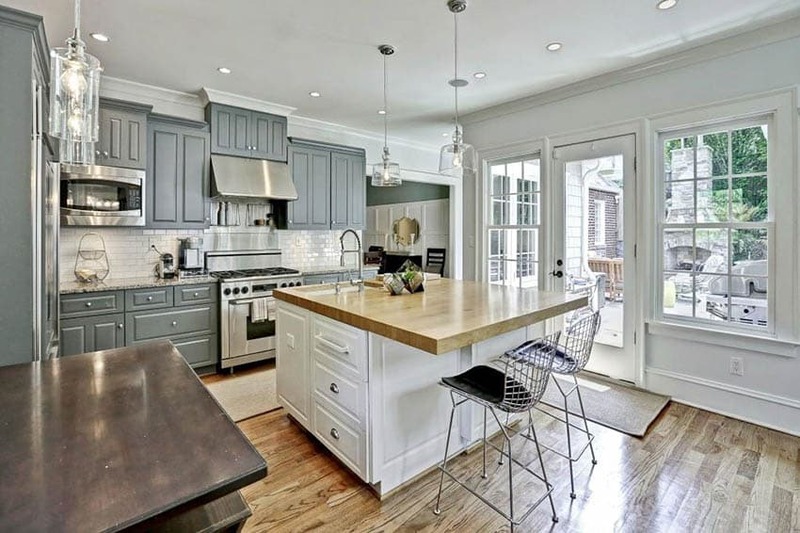 Greige – Another modern neutral which continues to be one of the best paint colors for kitchen cabinets is greige. Greige is a combination of the colors “gray” and “beige” – both universally popular neutrals which offer versatility and flexibility. Unlike, beige which can be sometimes hard to work with because of its yellow undertones, the addition of gray to a beige base gives greige the ability to coordinate well with cooler colors. Combining the two colors produces a whole new richer hue which offers the best of both worlds – the traditional warmth and relaxing vibe of beige and the subdued appeal and sophistication of gray. Greige works well as a kitchen cabinet color because it projects the perfect balance of cool and warm. Greige is also available in various tonalities. It can be adjusted into different levels to make a cool or warm neutral. The more it becomes leaned towards gray, the cooler it gets, while the stronger the presence of a beige undertone, the warmer greige becomes. Greige kitchen cabinets adapt well with any type of color scheme. It easy to introduce and accent color or complementing hue in a kitchen, depending on the intensity of the gray tones in your greige cabinets. Greige kitchen cabinets that are more gray are best paired with cool hues such as blue and white for a refreshing kitchen color scheme. While greige kitchen cabinets that has more beige undertones work best when complemented with dark wood finishes. This color of kitchen cabinet is also best paired with gold hardware and looks extra inviting and lively when combined with bright yellow accents and accessories. Navy Blue – Many find the color blue to be an unexpected choice of color when it comes to kitchen because it is often associated with being an appetite suppressant. However, navy blue paints have been continually picking up steam as a kitchen cabinet color this past few years. Navy blue kitchen cabinets offer a good way to introduce color to a space, without being too shocking nor being too dull. It brings in a strong colorful presence in a space and stands out when placed in a neutral setting. Navy blue kitchen cabinets also offer flexibility and versatility in more ways that you can imagine. Similar to a trusted pair of dark jeans, navy blue kitchen cabinets can be paired with almost any accent color and can work its way into any kitchen style and setting. Although it may not be as flexible as the popular neutrals, navy blue kitchen cabinets are workable into a ny color scheme and look extra stunning when balanced out with a shade of gray or a contrasting yellow accent. Other shades of blue which work best as a kitchen cabinet color are light powdery blues and beachy blues. Muted blues and light blue kitchen cabinets produces a more toned down appeal compared to navy blue and is perfect if you want to evoke a strong refreshing vibe and coastal comfort to your kitchen. Green – If you want to add more life to your kitchen, green is one of the best colors to paint your kitchen cabinets. Green is another go to shade for kitchen cabinets because it can bring in a refreshing feel to a space. Inspired by the color of nature, green kitchen cabinets have a natural organic vibe and looks exceptionally beautiful when paired with wood accents. Various shades of green can be explored as a kitchen cabinet color, depending on the prevailing style of your home. Lighter greens, such as mint green, are perfect for charming cottage kitchens, muted greens such as shade and olive green also work for country kitchens but can also be used for contemporary kitchen settings, while bright and bolder hues such as lime green are well suited for playful modern kitchens. Darker colors such as emerald green and hunter green can really make a statement on kitchen cabinets, but they work best in large spaces since they have the tendency to darken small rooms. If you plan to use them in a tiny kitchen, make sure to balance them out with light colored walls and accessories. Contrasting and two tone colors – If you are the more adventurous type, your kitchen cabinets are a great place to experiment with a more interesting color schemes. Instead of painting your kitchen cabinets in one solid hue, why not combine two different colors for your base and upper cabinets for a more heightened appeal and visual interest. By combining contrasting colors for kitchen cabinets, depth and dimension is also added to the space. 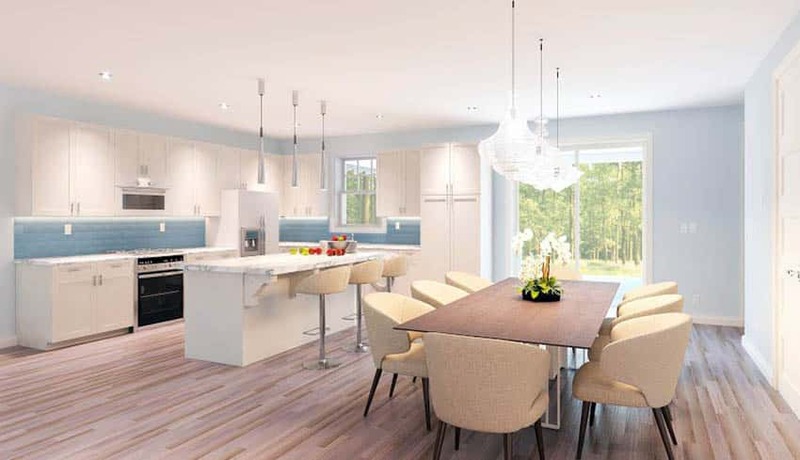 This design approach is also commonly applied to “contrasting kitchen islands”, wherein the center island is painted with a different color that contrasts with the rest of the main kitchen cabinetry in the space. The simple trick to pull off this look is put the light color on top and a darker one on the bottom. This stellar combination helps ground the space. You can either take a single hue, and paint a lighter version of it for the overhead cabinets, and take it a shade deeper for the bottom cabinets. You can also paint your kitchen island in a different color, if that suits your taste. The two tone effect helps the kitchen from being too overpowered by one single hue. Neutrals and colorful shades are also perfect for the two tone kitchen cabinet effect. The modern palette of a two tone kitchen cabinet typically combines a strong neutral, such as white, beige or gray, with a striking earth inspired color such as yellow, red or orange. In some cases, darker color such as brown or black is also used for the base cabinets. 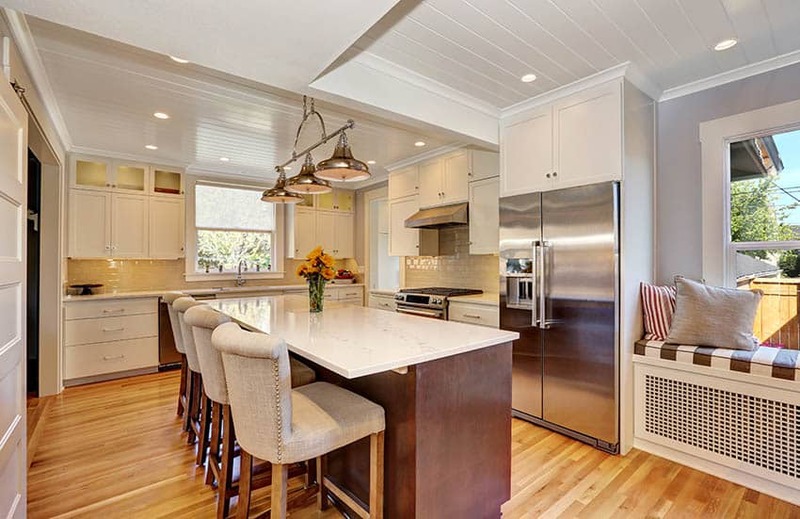 Nowadays, you see homeowners paint their overhead cabinets with a soft shade of cool gray, while their base cabinets are finished in a light, buttery yellow (for classic settings) or a cheery mustard yellow (for contemporary kitchens). Dark neutral hues such as taupe, charcoal gray and black are also commonly paired with warm tones such as terra cotta or sage green. Other popular combinations for two cabinets include cool and warm gray, natural wood tones and black, gray and green. When it comes to this design approach, there is actually no limit for the color choices. 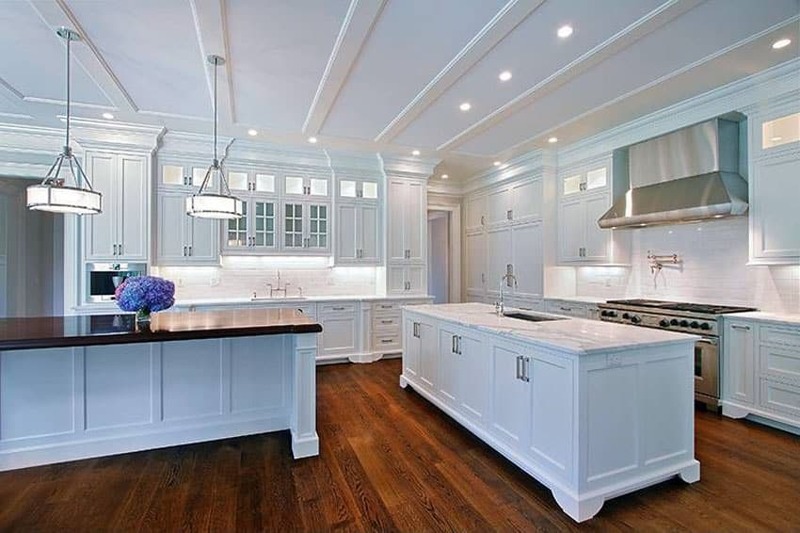 White kitchen cabinetry continues to be a classic favorite because it can transcend a multitude of styles and can also stand the test of time. That is why it is also always tagged as “forever timeless”. It can also instantly revive old cabinets and give them a refreshing look. The truth about white paints is that they are not created equal. There is no such thing as “pure white” when it comes to paint colors. There are thousands of white paints to choose from in the market. A single paint supplier can produce as much as hundreds of tints and shades just for the color white. For example, Benjamin Moore has a compilation of 152 paint shades for the color white and off white alone, imagine combining that with all the brands available in the market. In addition to the wide array of choices, the color white may have different undertones and versions to make them more appealing and to give them an added visual interest. There are several factors to consider in choosing the best white paint color for your kitchen cabinets. The first step to selecting the perfect white for kitchen cabinets is to decide on the undertone you want to stand out. White paint colors may have some tinges of blue, yellow, gray, peach or brown. Although generally light and airy, white paints can either be cool or it can be warm. More often, the undertones in a white paint are not that obvious in the first look, but once applied to the cabinets and placed alongside other design elements in the space like the countertops, walls, flooring and backsplash, you can see the undertones come to life. 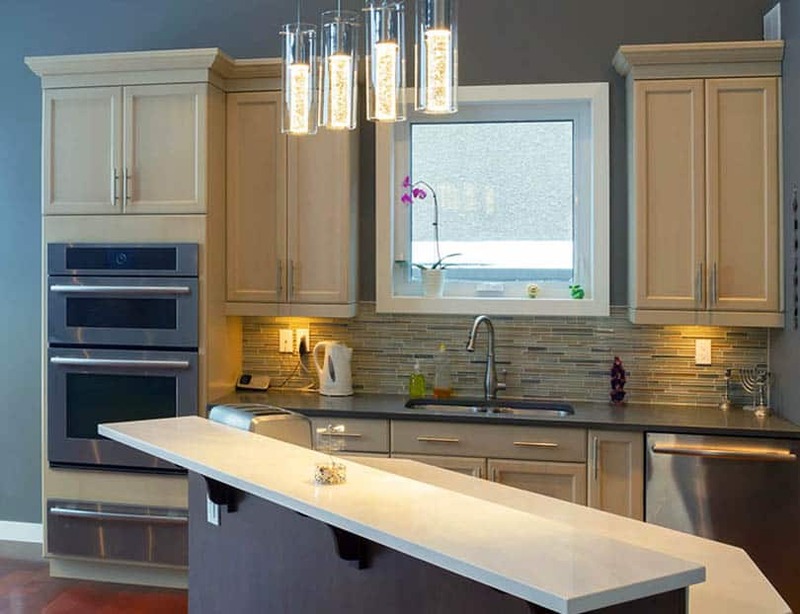 Lighting also plays an integral role in selecting the right white paint for your kitchen cabinets. As mentioned, lighting greatly affects the way a color is perceived. A specific white paint can look different when you look at it in the showroom versus using it at home. Your final white paint selection will look differently under artificial cool white light, daylight, warm white accent light and natural lighting. More often, a home improvement store will use bright fluorescent lighting, causing a different effect on the real color of the white paint, whereas at home, the lighting used is a combination of natural sources and ambient lights, thus producing a different color. With that, it is more advised to view your kitchen cabinets paint samples at home as it gives you a realistic preview of the final results. 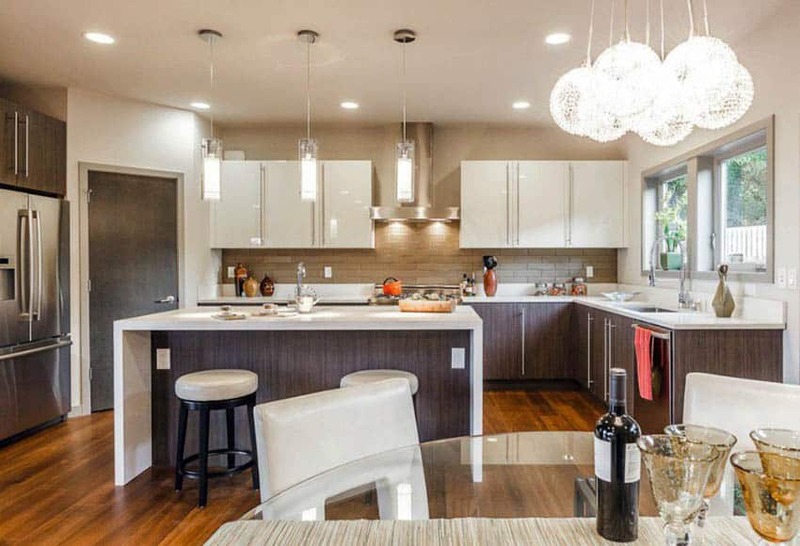 The prevailing style of the kitchen and the design of the kitchen cabinets are also significant in choosing the best white paint color for your kitchen cabinets. 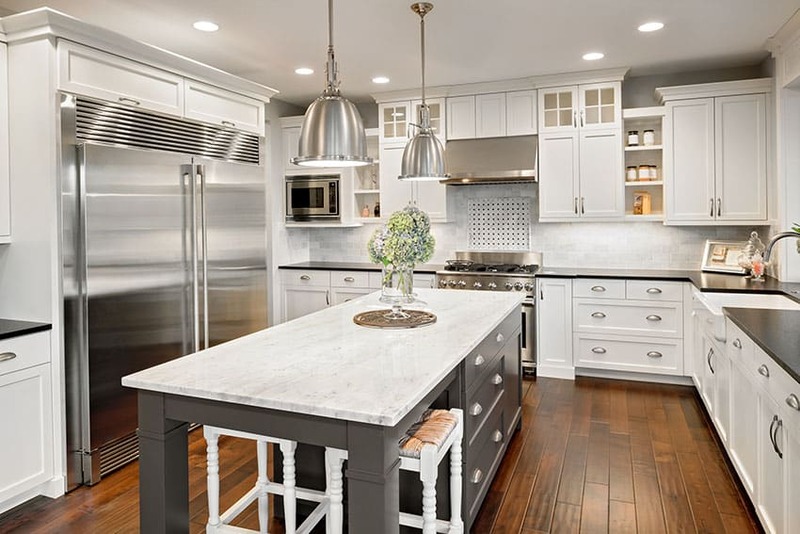 Traditional inspired kitchen settings and elaborate cabinetry tend to go with warmer undertones of white which include alabaster, beige, ivory and cream. While modern kitchens with minimalist kitchen cabinetry design are geared towards brighter whites such as ultra white. Super White, by Benjamin Moore – Formerly known as Super White PM-1, this paint color is a part of Benjamin Moore’s off white collection. Described to be not too warm nor too cool, Super White is inherently sophisticated and serene. Super White is best used for lacquered white cabinets and can be used for both traditional and modern kitchen cabinet designs. 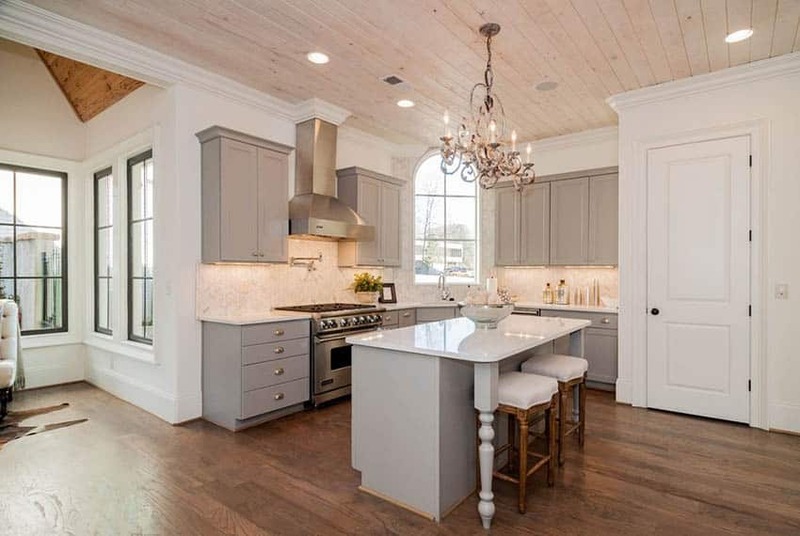 White Dove OC-17, by Benjamin Moore – Characterized as a classic, softly shaded white, White Dove is one of the best white paint choices for traditional inspired kitchen cabinetry. Chantilly Lace OC-65, by Benjamin Moore – A delicate and refined version of white, which is almost similar to lace this crisp, clean white is the perfect white paint for cottage and country kitchen cabinets. Navajo White, by Sherwin Williams – A creamy shade or white perfect for vintage inspired kitchen cabinets. Seaside Resort , by Benjamin Moore – This light and clean shade of white is the perfect choice for kitchen cabinets placed against a bold color palette. It can introduce a strong visual relief for bright kitchens. Dover White, by Sherwin Williams – This soft and soothing shade of white suits vintage style kitchen cabinets. Silver chain, by Benjamin Moore – If stark white paints are not your cup of tea, this grayish white is the perfect finish to contemporary kitchen cabinet designs. Swiss Coffee, by Valspar – An antique white shade, Swiss Coffee paint can be used to evoke vintage feel in your kitchen cabinets. White Tie, by Farrow & Ball – An off white shade with the right touch of cream. Containing just the right amount of yellow undertones, this paint color can help warm up your kitchen cabinets and produce a welcoming atmosphere for your kitchen. The beauty of solid wood dark kitchen cabinets is that it is versatile enough to work with both ends of the color spectrum. Dark paint colors can be used to complement it, while light paint colors can be used to contrast with it. With the endless shades and colors of paint that is available in the market, it is impossible to find not only hundreds, but even maybe thousands of shades to work with dark colored kitchen cabinetry. A lot of paint colors will work with dark colored kitchen cabinets, it just depends on the visual attribute and effect you want to achieve for your kitchen. Light colored paints can help tone down the richness of dark kitchen cabinets, while dark colored paints can help enhance its luxurious look. 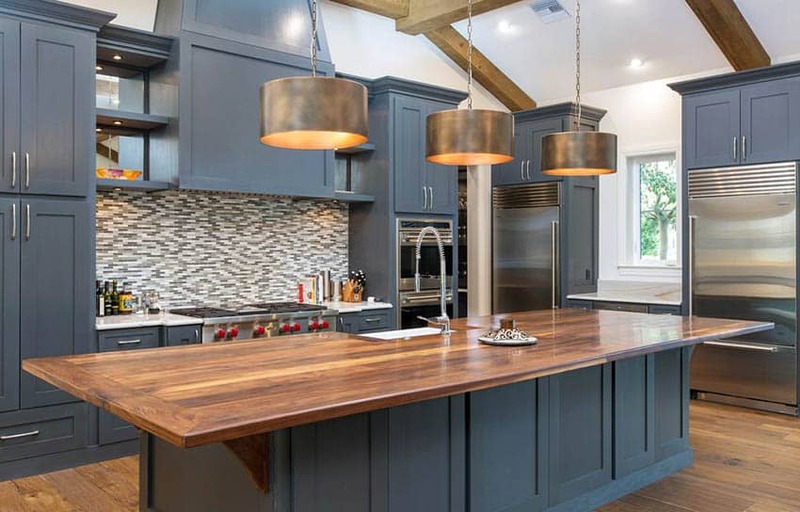 To minimize confusion and the stress of choosing between the broad spectrum of paint colors that can match dark kitchen cabinets, a good tip to keep in mind is to use the undertones present in the wood as your color guide. No wood is just plainly solid brown in color. It is never just dark brown, or tan brown or plain espresso. If you examine it closely, you’ll find that wood has a base color which tinges of hues embedded in its surface – whether from the natural wood grains, mineral streaks or even the stain used to finish it. Cherry wood, for example, has reddish undertones, oak has yellowish undertones, etc. In general, dark wood with warm undertones usually have inherent reddish tones, an orange tinge or a yellowish base. While wood with cool undertones typically have varying shades of gray casted over their surface. The general rule is to opt for paint colors which belong to the same color temperature. For dark wooden cabinets, the undertones present in the natural color of wood or the stain color of the material can be used as a complementary wall color. Beige and white – White and beige will always be one of the best paint colors in a kitchen setting, regardless of the color of the cabinets. For dark kitchen cabinets, white and beiges are typically used as wall colors if you want to create contrast. The neutrality of white walls provides a stark contrast against deep stained woods or any dark colored cabinet, whether it may be black or charcoal gray. White and brown, or white and any dark color has been considered as a classic pairing for many interior applications. Combining white can help balance the richness of any dark colored cabinetry. When paired with dark wood kitchen cabinets, white walls can help enhance the undertones of wood, making it appear brighter. Beige is another neutral that can be used as an alternative to white. For some homeowners, white walls can look a bit too dull, plain or even too sterile. Beige has a creamy tone, with a slight tinge of yellow. The presence of this slightly yellowish tint gives beige the right balance of warm and cool undertones. Compared to the bright, crisp appearance of white walls, beige walls have more warmth. Combined with dark kitchen cabinets, beige walls leave a cozy and inviting atmosphere. It can work the same wonders as a white wall can, making a space appear more spacious. White and beige paint can be used in different ways depending on the style of your kitchen. 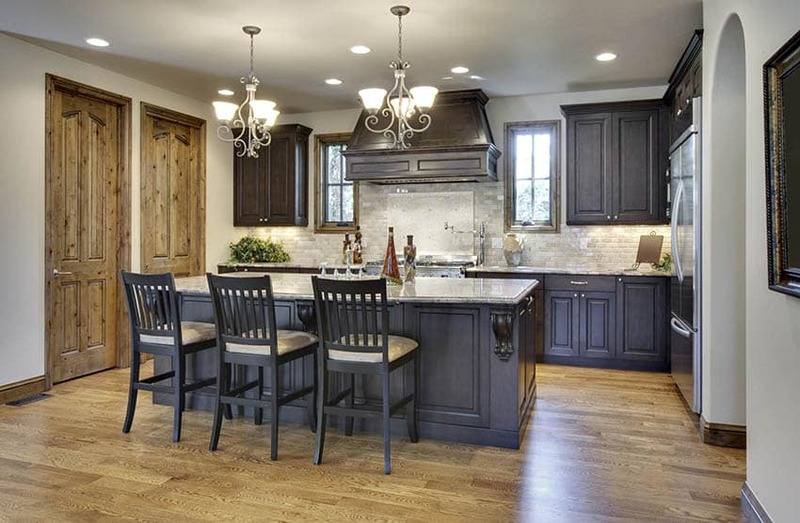 If working with a traditional and country inspired kitchen setting, opt to pair dark kitchen cabinets with beige walls. While if working with a more contemporary or modern setting, opt to pair dark kitchen cabinets with brighter whites. The combination of dark colored kitchen cabinets and bright white walls are prevalent in most modern minimalist kitchen designs because it exudes simplicity. This classic color combination also provides the perfect opportunity to introduce splashes of colors into the space. 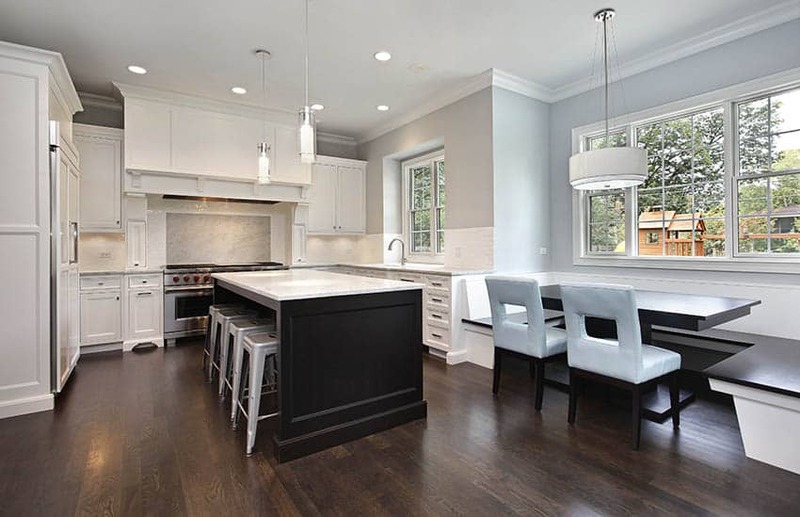 White or beige paint also does not compete with the richness of dark wood cabinets. If you want to make your dark kitchen cabinetry the focal point of the space, then this is the best paint color you can explore. Also, if you have a limited amount of space in your kitchen, and want a paint color that will make the space appear less heavy on the eyes and more spacious, white and beige paint is also your best bet. There are also some other shades that belong to the same color family which can go well with dark cabinets. Aside from white and beige, other best paint colors that can contrast with dark kitchen cabinets are off white, cream, ivory, ecru, pearl, alabaster, seashell white and frost white, to a name a few. You can ask your local paint supplier for more options that will fit your personal taste and style. 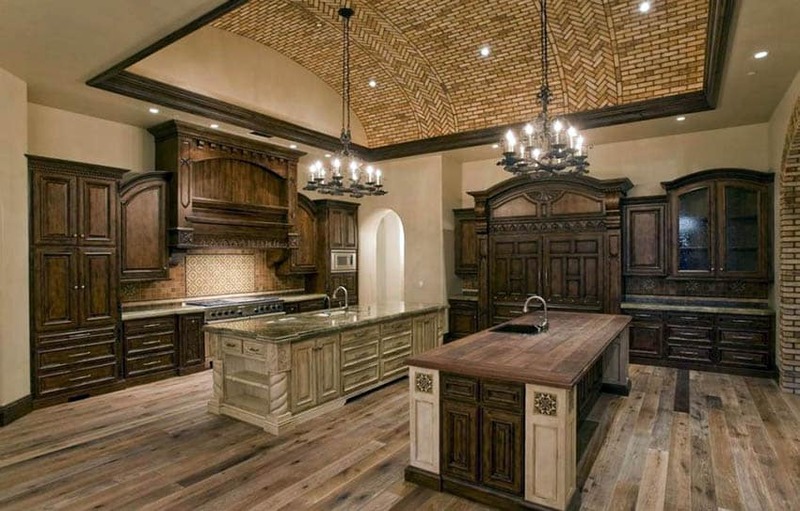 Shades of brown – Shades of brown are also an ideal paint color for dark kitchen cabinets as they complement each other. Shades of brown complement the inherent color of wood while adding to its natural warmth and coziness. 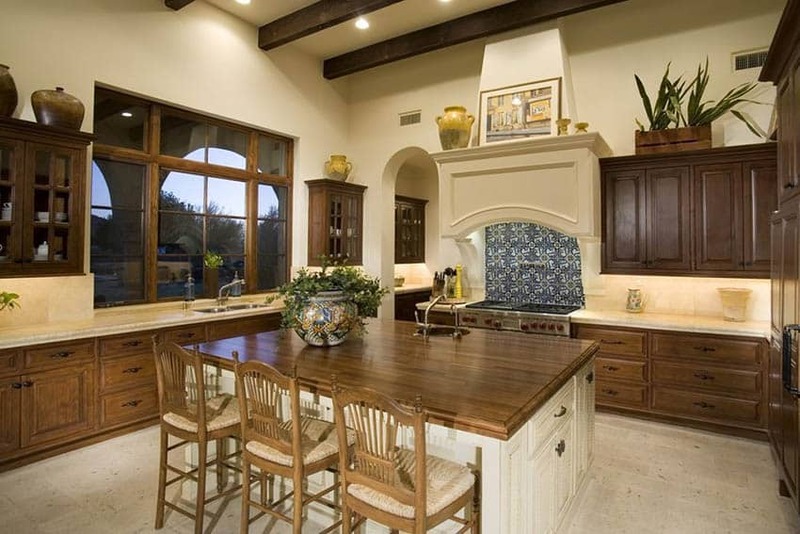 Combining dark wooden kitchen cabinets with brown colored walls will also produce a more “homey” feel for a kitchen. Dark wood finishes and brown paint provide the perfect opportunity to create a monochromatic color scheme for a kitchen. A monochromatic color scheme makes use of one hue in different shades and tints. When using a monochromatic color scheme for your kitchen, it does not necessarily mean that you have to stick with one exact hue of color and repeat it over and over for all the finishes in the space. You can take a single color and either tone it down to a lighter tint or adjust it to a darker shade. For example, if you have dark espresso kitchen cabinets, then you can use light mocha for the walls and a light colored wood for the floor. Sticking with one hue of color, for this case shades of brown, produces an overall look that is harmonious. To produce a well balanced layering of color, dimension and a less boring monochromatic scheme, make sure to combine the right intensities of color for the walls, cabinetry, flooring, countertops, splashboard and accessories. Diversity and variation in texture and finishes can also help prevent your kitchen from looking too dull. For an effective monochromatic color scheme, combine dark wooden kitchen cabinets with paint colors that have light to mid shades of brown. Opt for light mocha, tan or sand, and do not go with a very dark shade such as chocolate brown or hickory, since it has the tendency to camouflage dark wood finishes. For traditional kitchen designs, go for the lighter shades of brown or gold paints since they can tone down the heaviness of rich millwork and deep colored cabinetry. In general, paints in shades of brown paired with dark cabinets are more ideal for large kitchens and kitchens with open layouts. 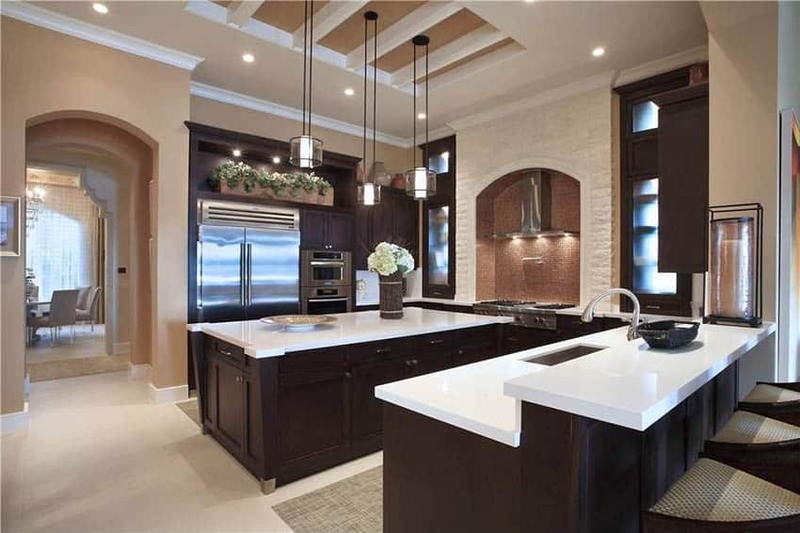 Deep tones – Deep tones are also another best paint color option for dark kitchen cabinets. Deep and rich tones include plum,navy, teal, moss green, emerald and wine red. These colors are best paired with dark kitchen cabinets if you want to enhance the warmth of dark wood, and at the same time, go ultra rich and create an opulent, stately and formal look for your kitchen. The beauty of deep and rich tones is that they can contribute a pop of color to a space without being too intense and overwhelming. Deep colored walls paired with dark colored kitchen cabinets give the natural richness of wood a more luxurious feel and also creates drama in a space. Typically, this color combination is more geared towards a traditional look like historical houses, old world houses or country kitchens because it does not deviate from the formality of a space. However, using deep tones as a primary color for the walls can be a bit tricky to pull off. Since your cabinets are also dark, you need some sort of balancing element to prevent the space from looking to gloomy or heavy. Introduce a light colored visual element to break off the color scheme, whether through the countertops, flooring or backsplash material. Also, go for the right intensity of color . 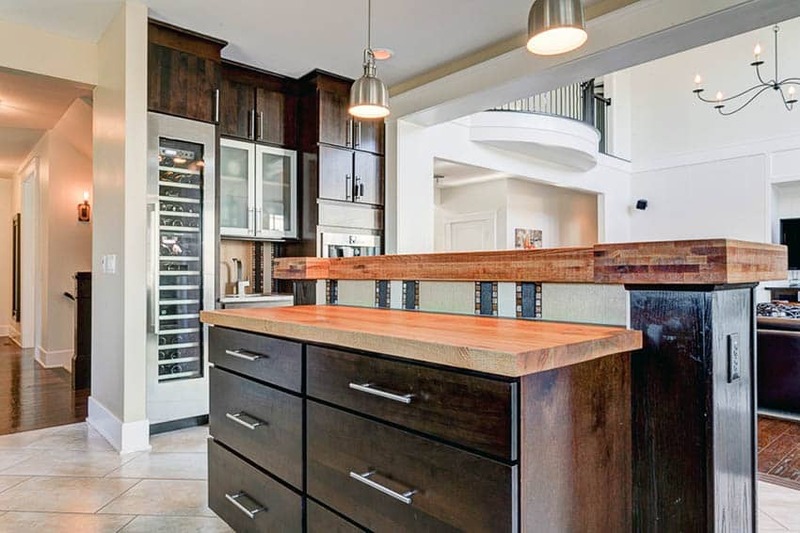 For the same reasons, the ultra rich pairing of deep toned wall paints and dark colored kitchen cabinets are more suited for large kitchens, as they have the tendency to make small spaces feel more cramped. Saturated and bright colors – If you want to give your kitchen an update, try pairing dark kitchen cabinets with bright, saturated colors. A bright colored wall can work wonders in transforming a cottage or country inspired kitchen with dark cabinets, and it can also make a formal kitchen setting feel more casual. Bright and saturated wall paint colors are also your best bet if you want to fuse different period styles or if you are aiming for an eclectic vibe. Popular bright colors which can work well with dark kitchen cabinets include saturated versions of green, red, yellow – which are basically hues derived from primary and secondary colors. Some examples of bright colors include rust orange, mustard yellows, lime green or apple green. If you can notice, these colors are more commonly used for modern and bold contemporary kitchen settings. In pairing bright colors with dark kitchen cabinets, the key is to create balance. Bright colors must be used smartly in a space, otherwise, they have the tendency to become too shocking. For example, a bright shade of paint used for the wall, may be used sparingly for matching accessories like the appliances, light fixtures, kitchen accessories like pots or pans, or a as accent color for the splashboard. Alternatively, your chosen bright and bold paint color can also be mirrored in a contrasting kitchen island or as paint for windows and doors for a modern vibe. Also, take note that the playful combination of dark kitchen cabinets and bright paint colors for the walls are more ideal for kitchens which have an abundant supply of natural and artificial light. Pastels shades of yellow – If deep toned paints are used to enhance the richness of dark kitchen cabinets, pastels shades, in general, are used to soften the heavy look of rich wood. Pastel colors are light tints of hues. These paint colors are typically used to add a bit of color to a space, without having to commit to the intensity of vivid hues. A pastel color may either have a cool or warm undertone to it. Among the pastel colors, the best paint color which works for dark kitchen cabinetry are soft yellows. As soft yellow wall can easily liven up a space and brighten the color of dark kitchen cabinetry. It creates a cheery ambiance and works best for adding charm to cottage inspired kitchens. In addition, pastel shades of yellow can also be used as a wall color for small kitchen since they end to make small spaces appear bigger. In addition to this, pastel yellow walls also do not can also compete with the richness of dark wood cabinets and can be used if you want to make your kitchen cabinets the focal point of the space. This paint color is not highly suited for dark wooden kitchen cabinets but it can also be used to complement dark gray or charcoal kitchen cabinetry. In order to create a cohesive overall look for your kitchen, opt for the lightest shade of yellow for the wall, then take this color and mirror it as a darker tones for your backsplash, accessories or window treatments. This approach produces a more balanced layering of color. Muted shades of green – Muted versions of colors are also an ideal complement for dark kitchen cabinetry, but one of the best colors that work with it is green. A toned down or muted shade of green, such as sage, moss or olive, pairs well with dark wooden kitchen cabinetry because both colors are naturally found in nature. Together, this combination creates an organic space, which is naturally cozy and has the right amount of warmth. Paint colors in muted shades of green are well suited for more traditional settings like a country home, but they can also be used in modern settings. Soft grays – For kitchens in modern settings, try pairing dark kitchen cabinets with a soft shade of gray. Considered to be the new alternative to white, this neutral color makes it to our list because it can help enhance the natural undertones of dark wood finishes, but it also has the versatility to be paired with sleek dark colored kitchen cabinets such as black, charcoal or even dark reds. Soft grays comes in a variety of tonalities and is good base color for kitchens which makes mixing and matching accessories easy. Although subdued, a soft gray paint for walls paired with dark colored kitchen cabinets can help create a dramatic effect in a space. It is mellow, not overwhelming yet can add depth and dimension to a space. Paired together, soft gray walls and dark colored kitchen cabinets can produce contrast. Dark grays can also be used as a paint color to go with dark kitchen cabinets as they also blend beautifully together. Although more popular in modern and contemporary kitchen settings,the combination of dark wood cabinetry and soft gray walls can also be used for traditional and transitional kitchens. The distinct warmth and golden tone of oak wood make it one of the best selling woods for kitchen cabinets. Extremely popular during the 1970’s and the early 90’s, oak wood kitchen cabinetry became a signature facet of American style kitchens. Traditional kitchen styles will often feature oak kitchen cabinets in honey colored stains and raised panel designs.Taking inspiration from this past trend and giving it a more updated look, oak kitchen cabinets continue to be a favorite in the kitchen design scene up to this day. It is not hard to see why many people are drawn to the inherent beauty of oak kitchen cabinets. Oak has warm, golden hue and an interesting, open, uniform, fine graining pattern that is distinguished by light reflecting rays. Oak wood has a warm undertone to it and if you want to accentuate warm woods, use cool colors and neutrals with cool undertones such as gray, white, blue, green and purple. Paint colors which are a few tones lighter or darker than oak wood can also help accentuate its features. To downplay the warmth of oak wood and tone it down a bit, use warm colors and neutrals with warm undertones such as beige, cream, brown and greige. Sticking with paint colors that have a similar depth to your wood, will create a more seamless look. Green – Green paint can help tone down the warmth of yellow toned woods. Depending on the intensity of green, you can create a whole new look for your kitchen with oak cabinets. Lighter shades of green such as mint green and sage green helps render to a calming, and refreshing feel to a space, while darker greens such as olive and hunter green produces a richer and more luxurious look. Muted greens, on the other hand, are your best bet, if you want to give your oak cabinets a more updated vibe. Together, this winning color combination is naturally organic and cozy. Shades of blue – Blue is one of the best contrasting colors for oak kitchen cabinets. This calming color can easily match with yellow toned wood, regardless of its shade, whether it may be rich navy blue paint, a muted bluish gray shade or a very light powdery blue hue. Light blue paints can help contribute a breath of fresh air and a whimsical pop of color to a kitchen with warm ak kitchen cabinets. Shades of blue can also enhance oak wood and offers a great way to give it a more updated look. Neutrals such as gray and white with cool undertones – Neutrals such as white and gray with cool undertones of green and blue also help accentuate the golden hue of oak kitchen cabinets. But at the same time, it creates a fresh and bright look for your kitchen. These colors can help balance out the space, while also allowing your oak kitchen cabinets to stand out. Beige – Beige shares the same color temperature with oak kitchen cabinets as both have a warm yellow undertone to them. 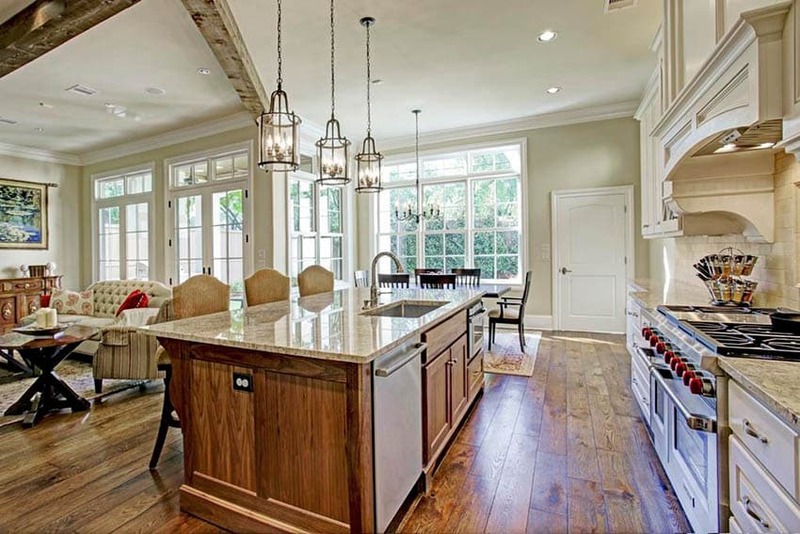 With a beige paint color, you can easily blend oak kitchen cabinets to the rest of the room. Staying on the lighter side will also produce a brighter look for your kitchen. The yellow undertones of beige walls can also help make a room feel more cheery. Greige – Greige has the foundation of a subtle gray base with a solid beige undertone. This paint colors is one of the best colors for neutralizing light oak kitchen cabinets. Greige walls and oak kitchen cabinets help create a well balanced overall look for a space that is equally cool and warm. Gray – Gray literally functions as a neutral when paired with oak kitchen cabinets, because its subtle color will not blend in with yellow toned wood, but certainly won’t highlight and accentuate your cabinets either. Cream – Cream is a warm shade of white with “butterscotch” or almost yellowish undertones. Similar to gray, this paint color also stands neutral with oak as it won’t entirely accentuate the yellow tone of the wood but it won’t camouflage it either. Together, cream colored walls and oak kitchen cabinets help create a room that is naturally warm and inviting. Softer Tan SW 6141, by Sherwin Williams – warm tan with a beige base that has subtle yellow and orange undertones. Edgecomb Gray HC 173, by Benjamin Moore – dusky greige or grayish beige with pinkish undertones, perfect for light oak kitchen cabinets that have a slight hint of pink. Collingwood OC 28, by Benjamin Moore – greige that has a soft yellow undertones. 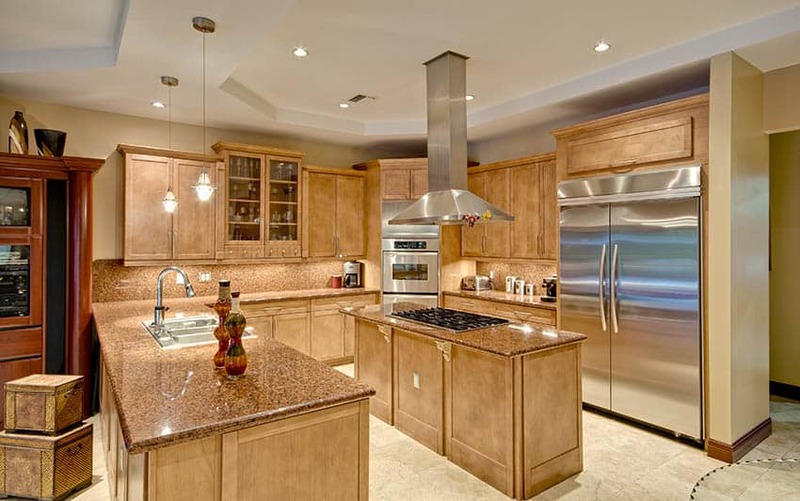 The most natural color of kitchen cabinets is brown, since it is also the inherent hue of wood. 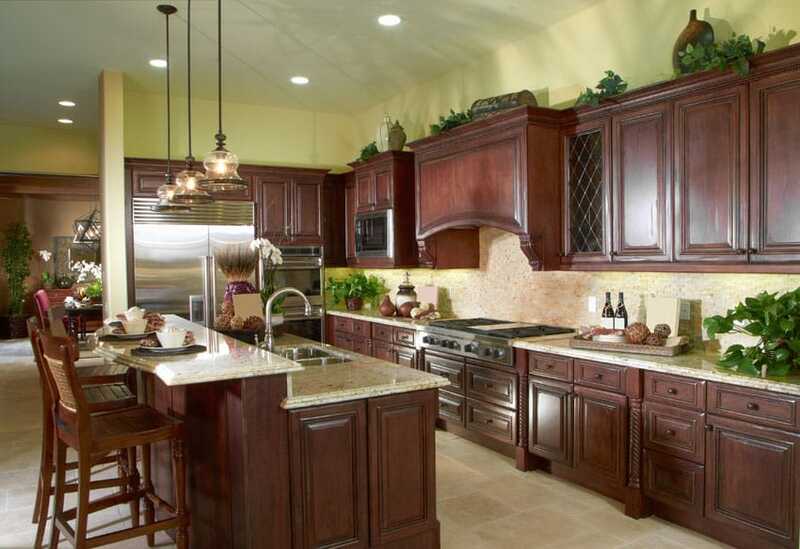 Most homeowners tend to go with kitchen cabinets in a shade of brown since they feel warm, cozy and organic. 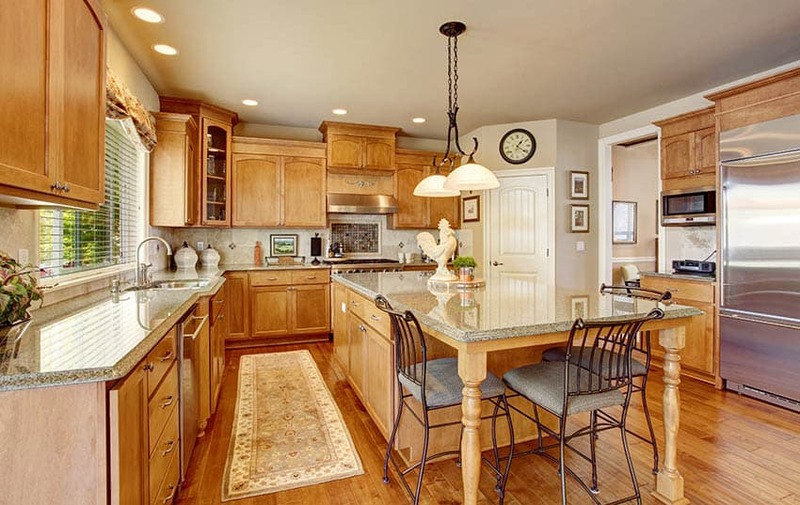 Choosing the best paint color for brown kitchen cabinets is really not that difficult. Although it may not be as versatile as white kitchen cabinets, brown kitchen cabinets have their own distinct aesthetic which works well with many color palettes. 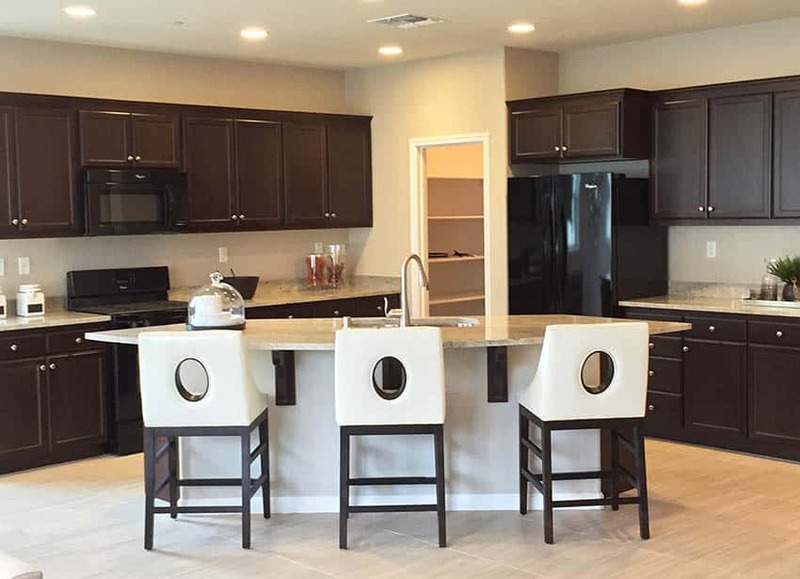 As with any color of kitchen cabinets, the first thing that you have to think about when choosing a paint color for brown kitchen cabinets is the visual attribute that you want to stand out in the space – whether it may be contrast or harmony. If you want brown kitchen cabinets to blend in or disappear in a space, opt for a paint color that is one to two shades lighter than your cabinets. 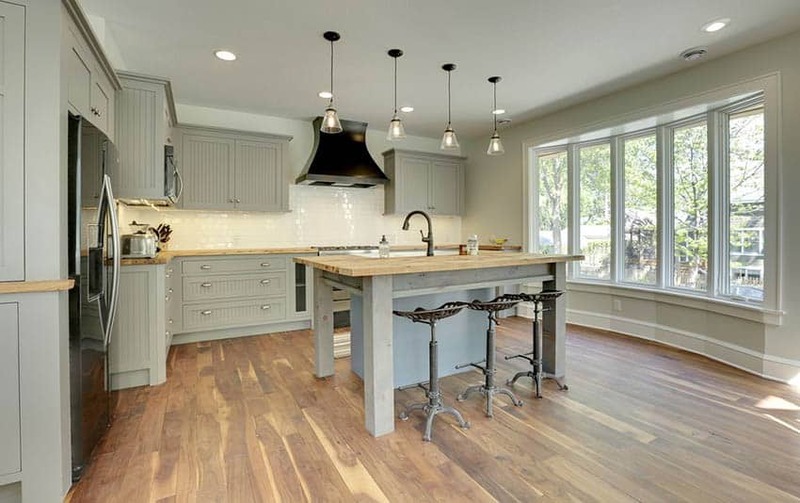 Wheres, if you want to complement the wood and make your brown kitchen cabinets the focal point of the space, find a paint color that comes from an entirely different family or palette, but still has a complementary tone such as light neutrals or cool hues. Shades of brown – The only way to blend brown kitchen cabinets into a space is to choose a paint color that belongs to the same color family. Think of light tans, mocha, taupe, sand, khaki and tortilla. Ideally, if your cabinets have a mid to dark brown, choose a paint color that is one to two shades lighter in order to create the perfect balance and layering of colors. 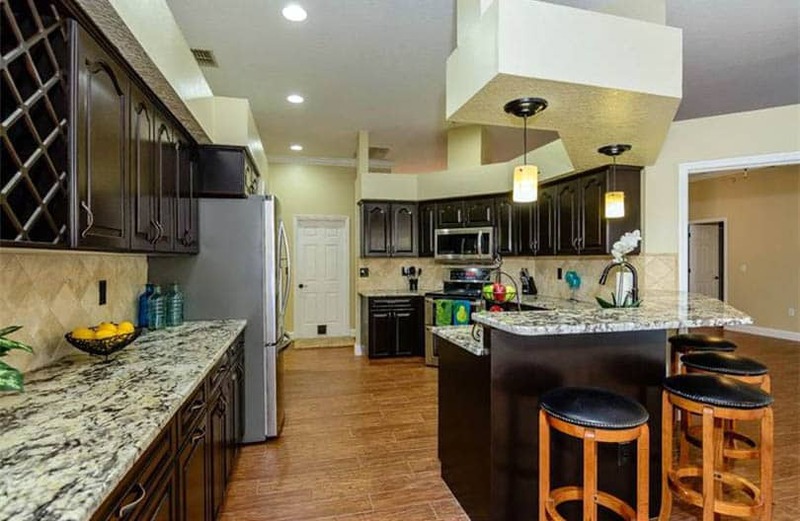 Although the goal is to blend and harmonize, you still do not want to camouflage your brown kitchen cabinets entirely into the space and mask their beauty under the same exact shade of wall color. Alternatively, you can also choose a shade of paint that closely matches one of the wood grains in your cabinetry. Pairing brown kitchen cabinets with light brown paint also in a way creates a perfect monochromatic color scheme. This color combination produces a natural cozy and inviting space, projecting layers of varying warm tones. 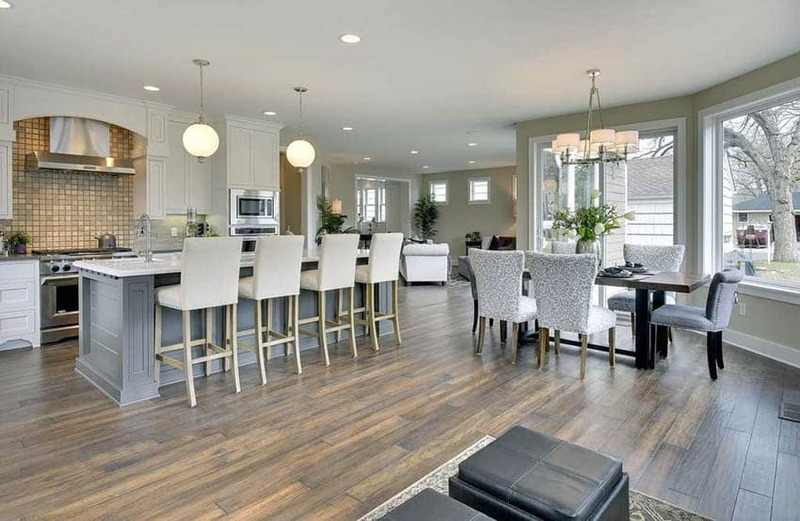 To create a more effective and cohesively tied, harmonious color scheme, make sure that the rest of the features of the room such as the backsplash, countertops and floor also has the same “brown” tone to them. Opt for muted brown paint colors that make a statement such as taupe and soft mocha because they have just the right tonality which can match with brown wooden kitchen cabinets, whether it may have a light or dark finish. Avoid dark brown paint colors because they can make your room feel more smaller and they can also lessen the appeal of your wood cabinetry. Cool colors – The best way to create contrast between kitchen cabinets and wall paints is to choose paint colors that are on the opposite sides of the color wheel. Brown is made from golds and yellows and the best complementary colors or contrasting colors to pair it with are colors which belong to the family of green and blue. Also, brown generally has a warm tone, so naturally, its opposite are colors with cool undertones. Explore paints in shades of light blue, medium blue, muted blue, soft grays, turquoise, aquamarine and teal to match with brown kitchen cabinets. While for green, try light shades such as mint, sage and muted tones such as olive, moss green and fern green. Cool hues can help make your kitchen feel more calm and refreshing. Also, try to introduce some type of neutral with cool undertones. 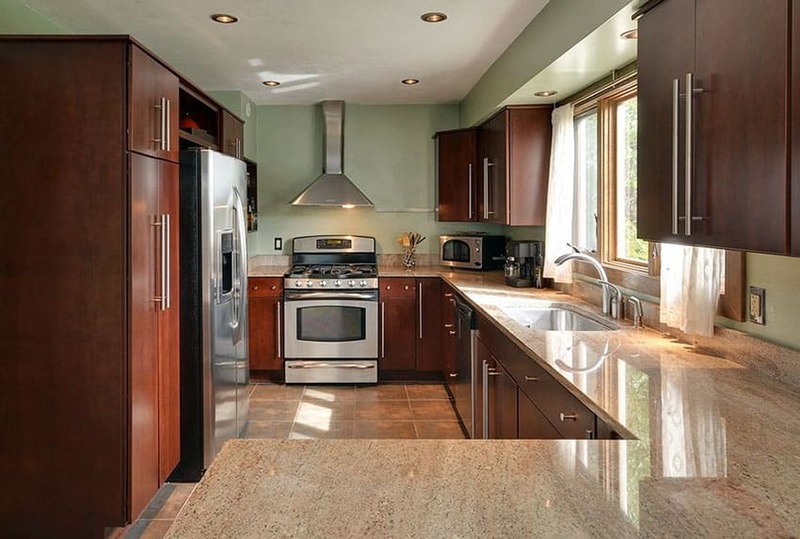 When paired together, cool hues and brown kitchen cabinets appear cleaner and brighter. 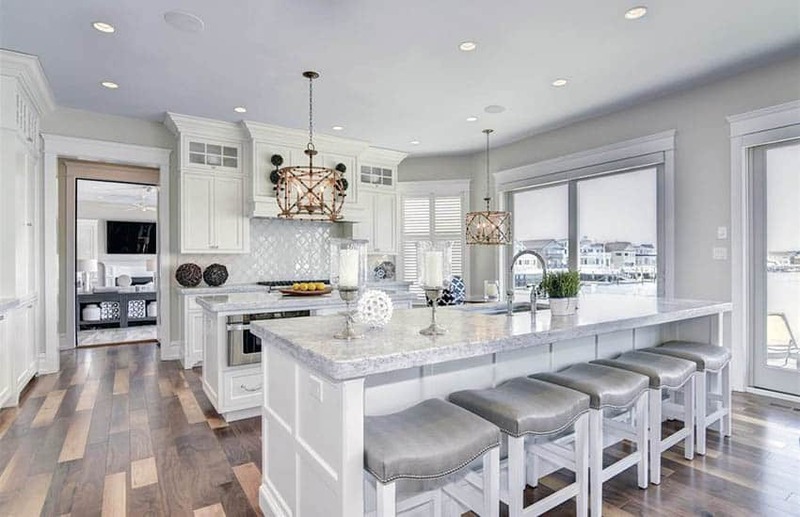 Light neutrals – Another way to create contrast with brown kitchen cabinets is to pair it with light neutral paints such as white, ivory or light gray. Light neutrals work especially if your kitchen cabinets are generally dark as it helps provide contrast. Also a light colored wall will allow your brown cabinets to stand out in the space, so if you want your cabinetry to be the focal point, then this is the way to go. 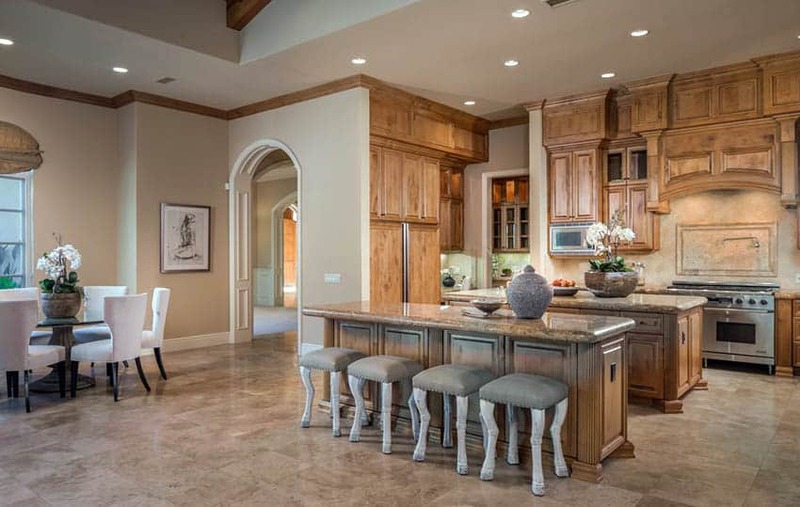 The best thing about pairing light neutral walls with brown kitchen cabinets is that it allows you to add any type of accent color to the space. Neutral colors are meant to compliment just about anything, so mixing and matching your countertops, flooring ,appliances and accessories are the least of your worries. Also, when placed against a white or soft gray colored wall, brown wooden kitchen cabinets look brighter. In addition, light neutral paints can likewise help the space appear more clean. Cherry cabinets are a true stand out feature in a kitchen design. People love its rich deep color and the natural warmth that they contribute to a space. 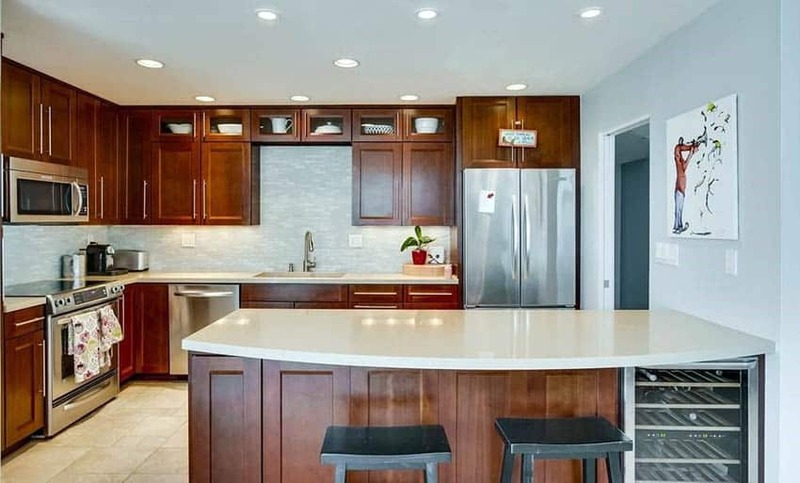 And since cherry cabinets boasts of a distinctive genuine aesthetics, the last thing that you would want to do is to hide that beauty against a poorly chosen color scheme. 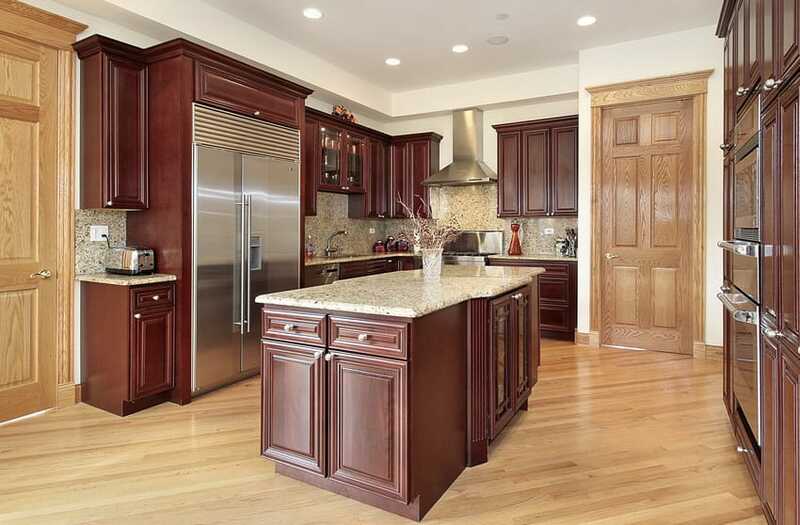 Fortunately, the natural rich deep color of cherry cabinets make way for a lot of possibilities in terms of design. Thanks to its red undertones, formulating the right color scheme to go with it can go anywhere from enhancing its luxurious look to toning down its richness. 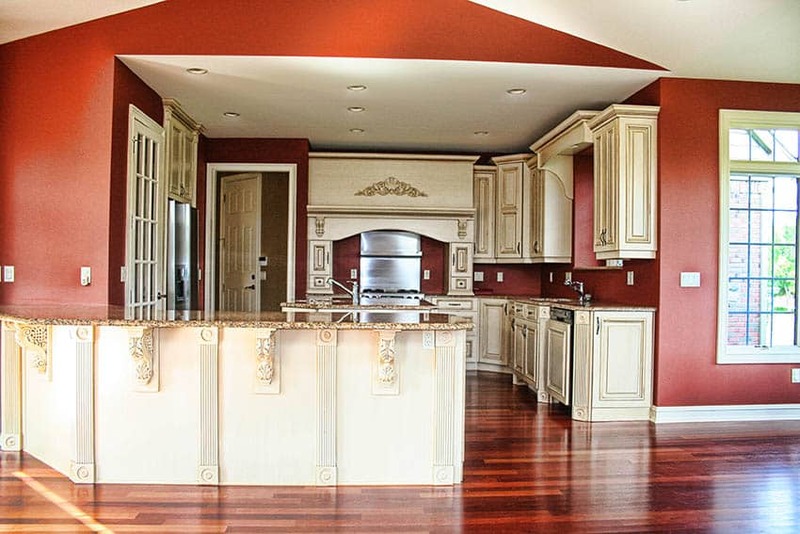 There are several wall paint colors which can be explored to match dark cherry kitchen cabinets. You can go with subdued neutrals like gray that help enhance it warmth, crisp white walls that help tone done its richness, earth colors that help its warm undertones stand out, deep shades that make it ultra rich or mellow pastels that balances it out. From which, we can derive that the paint color you choose will ultimately depend on the aesthetic value that you want to emphasize and of course, your personal taste and style. Earth colors – Earth tones or colors dominantly found in nature are a great wall paint color for cherry kitchen cabinets. Earth colors include shades of brown like sand, mocha, cream, tan, etc. 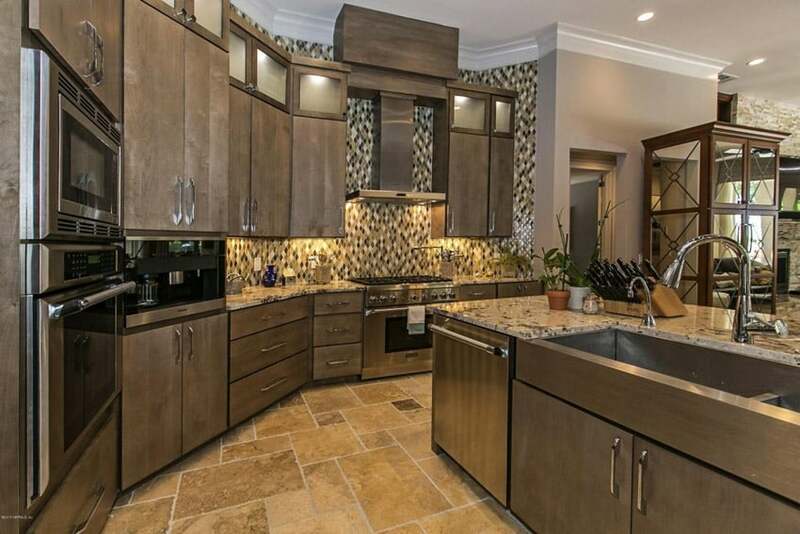 A wall painted with earthy shades of brown pairs well with cherry kitchen cabinets because it can greatly enhance its warm undertones, making the space feel more inviting. Earth tones are popular wall colors for cherry kitchen cabinets because they do not compete with the richness of its natural red color, rather they blend well with each other. A beautiful earth tone paint can serve a backdrop for the dark reddish color of cherry wood. This type of paint color can go well with anything, and when paired together, they create a stunning neutral color palette which provides a wide range of possibilities in terms of mixing and matching kitchen accessories. When choosing the right earth tone paint to go with your cherry kitchen cabinet, it is best to opt for shades which belong from the mid to the lighter end of the brown spectrum. Light and medium browns, such as sand, tan and light mocha are incredibly well suited for cherry kitchen cabinets because they can make the wood look brighter and cleaner. Alternatively, you can also try cream colored paints with brown undertones. Avoid darker shades of brown because they tend to camouflage cherry kitchen cabinets and have the tendency to make the space too heavy on the eyes. Wall paints in shades of brown paired with cherry kitchen cabinets also present the perfect opportunity to go with a monochromatic color scheme. Together, these colors complement the inherent color of wood and its natural coziness, making the space more inviting an homelike. To create a visually pleasing monochromatic color scheme, make sure to balance out the different shades to create some dimension. This can be achieved by varying the colors through textures, materials and finishes. Whites – White will always be a staple, “go to” paint color for any type of space. Regardless of the color of your kitchen cabinets or the type of species that it was built with, white walls will always be an ideal and safe choice to go with. The flexibility offered by white paint will never be matched by any other color. In fact, most people refer to it as the most versatile color because it goes well with anything. This wall color works effectively well with both light and dark colored kitchen cabinets, including rich red cherry wood. The main effect of the combination of white walls and cherry kitchen cabinets is that it makes the wood appear brighter and cleaner. 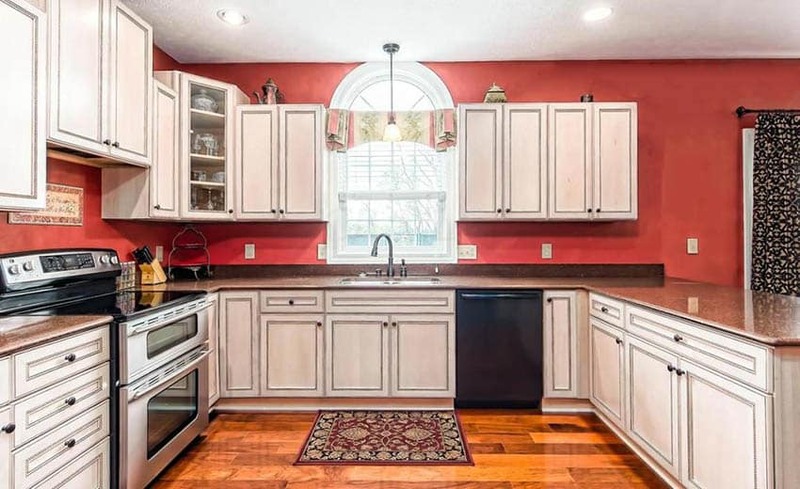 Also, white walls are perfect for creating a stark contrast between dark cherry cabinets. It does not compete with the inherent richness of the wood, but instead allows it to stand out in the space. If you have a small kitchen, white walls can help make the space appear bigger, more spacious, open and airy. Because the color white reflects light well, it can also make the space look more illuminated. It can instantly brighten the space, and lessens the “heaviness” that comes with the ultra rich color of cherry wood. 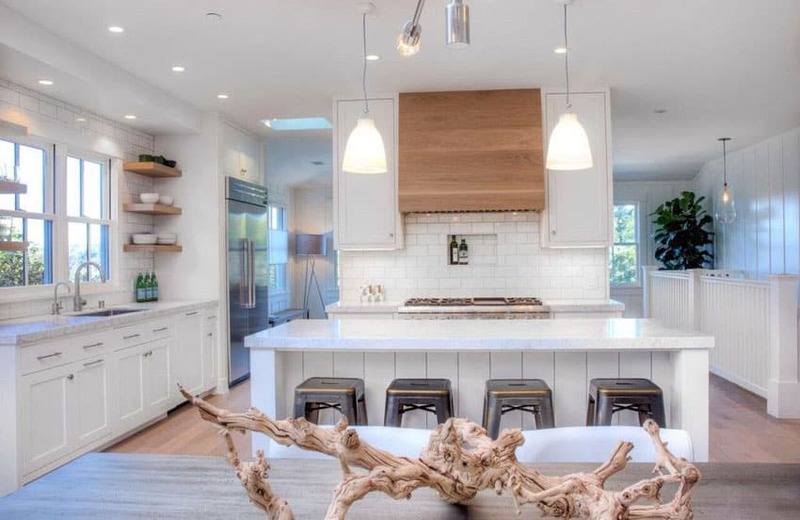 Aside from that, white walls have a timeless look which will surely never go out of style and present a wide range of design possibilities for your countertops, backsplash and flooring material. The color white comes in different tones which one can explore. Some have tinges of peach, blue, gray, yellow or brown. It is available in cool tones such as ultra whites, bright whites, pure whites, bluish whitish and grayish whites, and it also comes in warm tones such as cream, beiges, ivory and off white. Both cool and warm shades of white can be paired with cherry kitchen cabinets to create a well balanced color scheme. Bright, crisp white walls can be paired with dark cherry kitchen cabinets if you are aiming to create a fusion of classic and contemporary styles. However, if you are not a fan of the striking color of bright white walls, opt for other shades with warmer undertones. Beige, cream, ivory and off white are perfect wall paint colors for traditional inspired kitchen settings with dark cherry cabinetry. Cool shades of gray – Another neutral which makes it to the list of best kitchen paint colors to match cherry kitchen cabinets is the color gray. Considered to be the “new neutral” of the interior design scene, gray works well as an alternative to white. Most homeowners who find white or beige too plain or boring tend to go with this versatile color. Although both light and dark shades of gray can be used as wall paint colors for cherry kitchen cabinets, those that belong to the lighter, or cooler end of the spectrum are your best bet – think of cloud gray, fossil gray, soft gray and taupe. In general, it is best to avoid shades of gray which are too dark or leaned towards black, such as charcoal, shadow gray and iron gray, since it can make the space appear too heavy on the eyes and make it feel too cramped. When paired together, cool shades of gray and dark cherry kitchen cabinets creates a dramatic effect. Gray walls are very subdued, can lend a quiet strength to spaces and are not overwhelming. They won’t steal away the spotlight from the beauty of rich, cherry kitchen cabinets. Warm yellows – If you want to add a bit color to your rich red cherry kitchen cabinets, try yellow paint for your walls. A warm, sunny shade of yellow can help add warmth to cherry kitchen cabinets making your kitchen feel more inviting and welcoming. Warm yellow walls are also a great way to introduce a cheery ambiance to your kitchen, without being too intense. When choosing the best shade of yellow paint to go with cherry kitchen cabinets, opt for light honey, mellow butter shades and golden yellow. Green – Another way to add color to a kitchen with cherry kitchen cabinets is to use green paint for the walls. Green and red – the dominant color of cherry kitchen cabinets, are complementary colors, meaning they go opposite together in the color wheel. Together, shades of green and reddish undertones create a stunning contrast that can add depth, dimension and visual interest to a space. Walls painted in shades of green can also make the inherent rich color of cherry wood to pop out more, make its graining pattern more prominent and makes the wood appear brighter. Different shades of green work well with cherry kitchen cabinets and all of which can be explored, depending on the effect you want to achieve for your kitchen. To create a subtle effect of contrast and introduce a hint of color, try mellow shades like tea green, mint green and celadon green. Lighter shades of green allow the beauty of cherry cabinets to stand out. Muted shades of green like moss green, sage and olive green can help down down the richness of cherry kitchen cabinets while deep and dark shades of green like hunter green and forest green can help enhance drama in a space. Darker shades of green are also more commonly used for traditional kitchen settings. Pastel colors – Pastel colored walls are another way to introduce color to a kitchen with cherry cabinets. Pastel colors or light colors, are perfect for homeowners who do not want to commit to intense vivid hues. Unlike dark and vibrant shades, pastel colors will not compete with the richness of cherry kitchen cabinets. In general, pastel colors help create a livelier mood in a kitchen. There are many pastel shades of paints to choose from. Some have cool undertones, while other have warm undertones in them. Cool pastel colors include light blue, light green and soft grays while warm pastel colors include mellow yellows and peach. These two opposite ends of the spectrum work differently when paired with cherry kitchen cabinets. Pastels with cool undertones can help uplift the natural grains of cherry wood, make it appear brighter and make its color pop out more. Whereas pastels with warm undertones can make cherry wood appear warmer and more inviting. Just like any light color, pastel colors help create an illusion of a much bigger space. 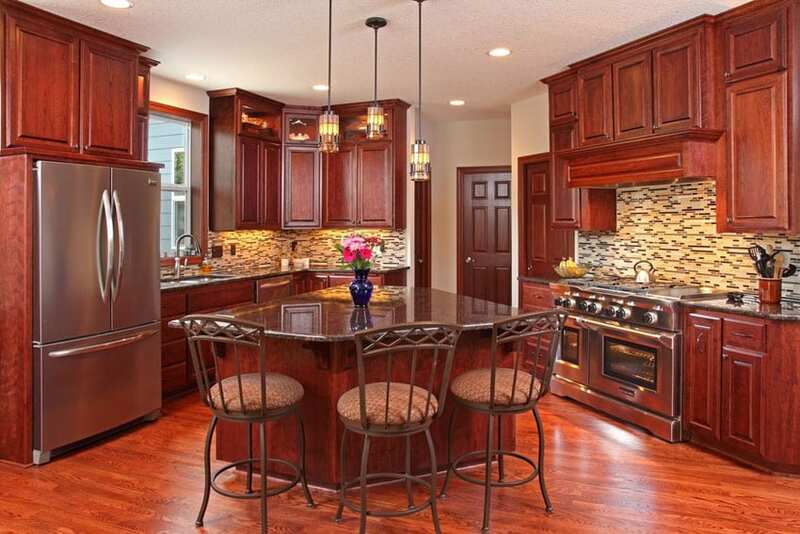 When paired with dark cherry kitchen cabinets, they create a more well balanced look. As mentioned, pastel colored walls can make the richness of the wood also pops out more, thus they are highly suited if you want to make your cherry cabinetry as the main focal point of your kitchen. If pastels do not fit your taste, you can create a more muted and subdued shade of color by toning it down with a bit of white or cool gray. Orange, for example, can be mixed with white to create a peach hue or green, can be mellowed with a bit of gray to create sage. This provides for more options in decorating for kitchens with cherry kitchen cabinets. Although light colors, in general, work best with cherry kitchen cabinets, there are still some shades which can look a bit off as part of its color scheme. Lavender, pink and light blues or colors which belong to the same family, so not work well as much as light oranges, yellows and greens. Reds. Although they belong to the same color group, there is a tendency for cherry cabinets and red walls to compete for attention. Since red is the primary undertone of cherry cabinets, matching it with a red wall may overwhelm the space. Also, avoid colors which are too vivid and bright as they can overpower your cabinetry color. Pink also does not go well with cherry cabinetry. 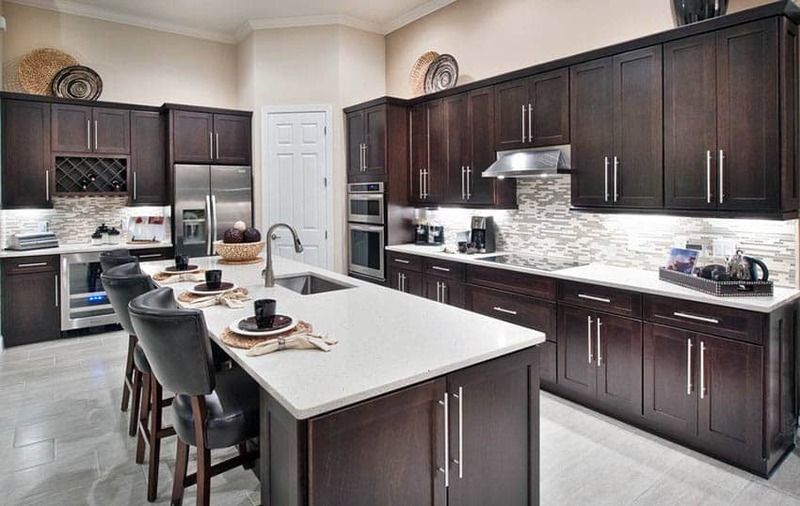 Black and dark grays – Neutral colors that you have to avoid for cherry kitchen cabinets are black and dark grays. Black is too dark and might clash with the reddish undertones of cherry cabinets. Dark grays also do not compliment cherry kitchen cabinets well, and may be too heavy for the eyes. The last thing you want is a wall color which will compete with the real beauty of your wooden cabinetry. For more related ideas take a look at our gallery of dining room paint colors to put together a cohesive design you’ll love.